A star-studded lineup. Spectacular sampler quilts. And 48 quilt-block patterns that’ll turn you into a "Blockhead"—and we mean that in the VERY best of quilty ways! It started as a simple idea: celebrating traditional quilts and quilters by having six Moda designers host a yearlong block-of-the-week program on social media. Every Wednesday one designer would publish a block pattern, and the others would make that block using the reproduction and primitive-style fabrics they loved. And that’s how the Moda Blockheads were born! The six original Blockheads invite you to join them for some block-making fun! Now all the block patterns the designers created are available in the book Moda Blockheads. 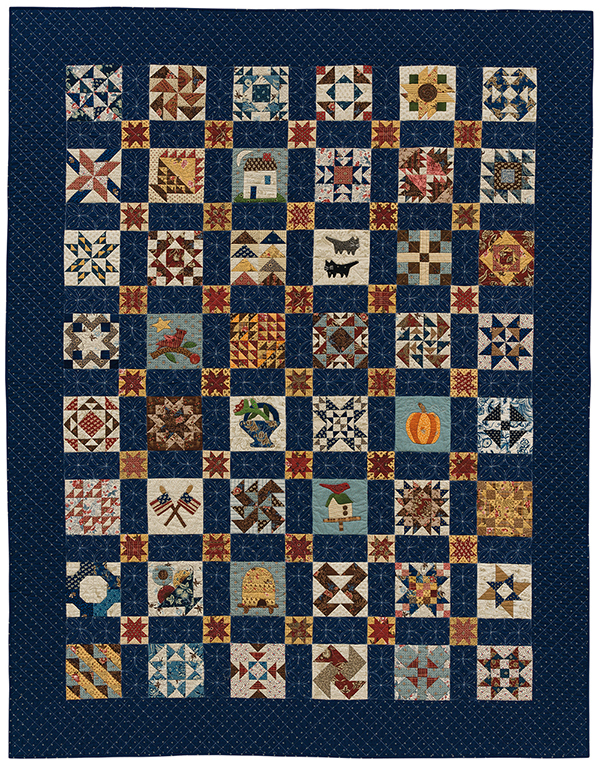 Quilting stars Lisa Bongean, Betsy Chutchian, Lynne Hagmeier, Jo Morton, Jan Patek, and Carrie Nelson offer imaginative interpretations of a whopping 48 blocks, both new and classic. Each 6″ x 6″ design is lovingly chosen by the Moda Blockheads for quilters who want to be Blockheads too! You’ll love this varied collection, from traditional patchwork inspired by history to whimsical appliquéd scenes from nature. Instructions for the six jaw-dropping sampler quilts allow you to showcase the beautiful blocks you make. Take a look at the quilts each designer made from their stack of blocks—which sampler would you make first? From Carrie Nelson—that sashing really makes our hearts flutter! Please don’t make us choose a favorite—it’s like trying to choose a favorite kid! Now it just wouldn’t be a Moda Blockheads celebration without a little fabric thrown into the mix, right? Tell us your answer in the comments and you could win the bundle from Moda and the book from Martingale! We’ll choose a random winner one week from today and let you know by email if you win. Good luck! And if you’re ready to be christened a Blockhead ASAP, you can order the book at our website and you’ll be sent a link to instantly download the eBook for free. What a wonderful giveaway..thank you. I can’t imagine how many blocks I’ve made over the years but each every one has been made with love and happy thoughts for the person who would receive them. OMG I have been quilting for 30 years – I have no idea how many blocks I have made as I have made 2 Dear Jane quilts as well as several sampler quilts over the years – I will give a guess at 300 as I know I have had a lot of repeats over the years. I have been coordinating my quilt guild’s block of the month for about 3 years, so I make 3 samples every month, plus the blocks I make for myself and my own quilts. I have made lots of block – and I think I can accurately be called a "Blockhead!" I love these blocks from 2017, and now the ones from 2018, as well! Love the book. It is amazing how different each quilt looks. I am enjoying collecting Blockheads blocks! All are beautiful! Gosh, I am probably getting close to 2,500 blocks. I have been only quilting for the past 10 years. These blocks include pieced and appliqued with both cotton and wool. Thanks for the chance at the new book! It’s on my list for sure! I would guess I have made over 200 different blocks, so a big Blockhead! Goodness knows! I’ve been quilting for well over 40 years so wouldn’t even know where to begin in even guesstimating! It is so very fun doing quilts that have a lot of various blocks. Would love to have this wonderful package!! Probably 2000. I’m not a very prolific quilter but I’ve been quilting for a long time. Wow! How many blocks have I made in my quilting career — I am sure it has been over 100. What energies and inspirations and how you get us to keep sewing and quilting, I need this book and oh the fun of winning, and no I have not made all that I want to yet. How many different blocks? Wow what a question! As a quilter for many years that’s a tough question but I’d guess more than 100 if you count variations of old favorites. Love the Blockhead blocks! I just can’t even get any count of how many blocks I may have made in the past. I am now beginning to work with smaller blocks so anticipate the number of different styles to increase. How do I love thee, let me count the ways.. As someone who has been quilting for 35+ years, I cannot begin to count how many blocks I have made. I love sampler quilts. My first quilting class had us making traditional blocks which I turned into pillows for my sofa. That was back in the day of browns, golds, and greens. Would love to have that wonderful fabric collection to work up some more blocks that are new to me. I’m sure I have made well over 2000 blocks but they may not have all been different, but I do more samplers than all one block. After doing a Dear Jane Quilt and more BOM’s than I should admit to, I would guess my total to be somewhere in the 800’s. I have been quilting for a really long time, so my best guess would be at least two hundred, but probably much more! After 30 years, I would estimate that I have made thousands of different blocks. Today, I love taking the traditional blocks and quilts and making them in a modern design. More than that I love collaborating with my "Sewsisters". I have really enjoyed following you and your Blockheads! I can only imagine the fun you have had putting this all together! Remember, a Happy Quilter is cover with loose thread sitting in a pile of fabric designing, sewing and ripping! I’ve made at least 200 different blocks as I like to make intricate hand pieced blocks as well as machine pieced blocks. I love how people have personalized their Blockheads quilts. Very inspiring! Even though I love quilting, I have done very few pieced blocks, maybe 4 different ones. Now that I am retired, I am hoping to expand on that quite a bit. I have been quilting almost 30 years and love just making blocks. I have made at least 1000 blocks in that time and am still making more. Let’s see, 2,594! Just kidding. I love to try different blocks so I’ve made a lot. This book and fabric would be a great prize! It’s hard to guess…maybe 50. I have made maybe 40 or 50 different blocks. The book looks lovely! I think I’ve made thousands, at least it seems that way. I do a lot of donated quilts to Linus Blankets. I 💘 making blocks. I think I will make half of them in my life time. Excited to get started. I love to piece and have probably pieced and appliquéd close to a thousand different blocks. That doesn’t count the ones that I have made multiples of for quilts or wall hanging. I think that there are many more that I need to piece! I think I have made over 75 – which doesn’t sound like a lot looking at the block heads. I obviously need this book to expand my block knowledge. And I LOVE Lynne’s fabrics! I have a crazy 8 – 5 thing that gets in the way of my quilting so I’ve not made many quilts, much less that many different blocks. I have done a couple of BOMs with sampler type blocks and a couple of BOMs with applique blocks. My guess would be about 100 blocks over my quilting life. What a beautiful bundle of fabric! How many different blocks have I made in 60+ years of quilting and sewing? Very hard to answer, besides making blocks for quilts, the blocks were made for tote bags or purses, sometimes to decorate a sweat shirt, jacket or some other clothing item, some were Christmas tree ornaments. Sometimes just to try something different. So a guesstimate would be between 500 and 1,000 different blocks, maybe more when I think of different sampler quilts with a their variety of blocks. HUNDREDS! … and that is not including personal projects! I have been a member of a couple of quilting groups for 20 years. They each have a monthly Block Lotto; block patterns handed out each month with color specifications. Members make 1-or-more. The next month they are displayed and one lucky member WINS them all! Winning this book and the fabrics would be even better than winning Block Lotto! I would guess 500+ in my lifetime and still stitching! Probably close to several 1000 – just a guess. Wow! This one makes me think about all of the quilts over the years. Some are made up of different blocks and others are the same 1 or 2 blocks for the whole quilt. Then a lot of blocks are variations and sometimes just changing the colour placement changes the look of the block. I am just going to say a large number of different blocks have been made over my quilting career! I try new blocks but have only made about 24 block patterns..
Have only been quilting for about 8 years. I estimate that in that time period I have worked on about 140 different blocks in the quilts I have constructed. Probably not as many as others – but they are fun – and at times a challenge. I have made dozens of different blocks. I have some of Block Heads 2 done, but I didn’t do Blockheads 1, so I would love to have the book! It’s a guess, but I think I have made somewhere between 200 and 300 different blocks. It could be more, but I don’t think it is any less that that. I’ve been quilting for about 3 years now and have made around 700 blocks. I have made hundreds of different blocks – too many to count! In the 20 years that I have been quilting I estimate that I have stitched over 35,000 quilt blocks. I continue to stitch quilt blocks and am going to love creating this Block Heads sampler. Heavens. Have never thought to keep track. They have been fairly simple block. Prefer simple designs. Now I’ll think on this for weeks to come. Gosh I’m not sure how many. Blockheads, sampler quilts and others probably add up to quite a few! I could only guess but it would have to be in the hundreds. I guess I have made over 500 different blocks since quilting as a child. I love sampler quilts since there are very few blocks I want to make repeatedly. The Moda blocks have been wonderful inspiration. 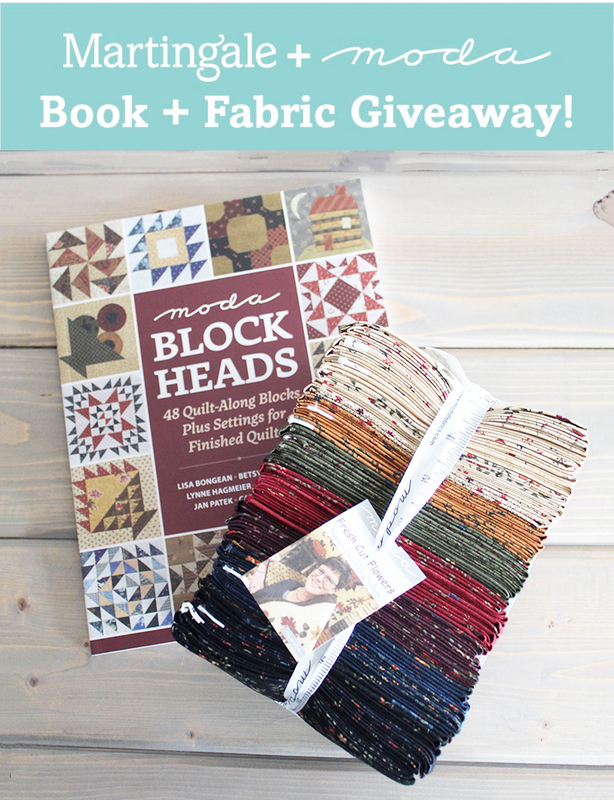 win this lovely bundle of fat quarters and Block Heads Book. Oh yes I’m a block head! But, I’m on the low number side….plan to make many more! At least 40, I once used them for a game at my guild. A block was pinned to the back of each person, and they had to guess its name by asking questions of each other. Great ice breaker! I haven’t actually done a lot of blocks. I have done a lot of modern quilts where there isn’t specific blocks. This book is very inspiring and I am anxious to try one of the quilts. I love the different layouts shown. I have probably made several hundred. Winning this book and fabric would let me add to the count!! How many quilt blocks have i made? Good question! Since I have never kept a tally I really had to think about this. I have made quite a few different sampler quilts. I will guess between 300-350. Thanks for the chance to win! I am not sure my best guesse would be 3 dozen. I’ve made 100,000ish quilt blocks! I just recently began hearing and reading about Blockheads. Sure looks fun! Gosh! I’ve never thought to count how many blocks I’ve done!!! LOL!!! I did 20 blocks for one quilt, similar, would that count as one? I have sewn numerous blocks and I intend to sew many more!!! Over 300, I made a Dear Jane which consisted of 225 pieced blocks pieced completely by hand. I’m currently halfway through a Farmer’s Wife quilt which has 99 pieced blocks,so over the years I would guess 300 blocks. When I first started to quilt I used Judy Martin’s book Ultimate book of Quilt block patterns and I was on my way. I’ve been quilting since 1970 so I would guess I’ve made nore than I could count but I still continue on making them. Making them is good for the soul while giving to others. i’ve been quilting for 20 years so i think i have probably made over 1000 blocks. i rarely make the same quilt more than once so it adds up quickly. I’d guess with all the BOMs and samplers plus starting on the blockheads I must be well over 100 with more awaiting! Wow! Love this book. Tough question – over 100 I’m sure but no clue really! After 18 yrs of quilting, thousands upon thousands!! I think I have made about 1,500 blocks in my quiling career. I’m sure it has been hundreds. I have some favorite blocks that get made often but I love to try new ones also. I don’t even know how to make a good guess–maybe 100?? Fairly new to quilting so maybe a dozen or so. I love to applique. I have made numerous quilts in the last ten years that I have been quilting. But no as many as I would like since I do it all by hand. The applique and the piecing and the quilting. I’ m 77 so it’s really hard to determine how many blocks I have made. Sometimes it took a really long time to complete a project. I’m going to estimate 100. I’ve never made a sampler quilt, but I have been quilting for over twenty years so I’m guessing in the hundreds??? Interesting question. I like blocks. Guessing 3 figures, in the high hundreds. Some many times and some just once. Wow, I’ve been quilting for eleven years non-stop, so hundreds. I like trying new designs and learning from what I make. Thanks for a chance to win the book and beautiful fabric! I’m pretty sure I’ve made eleventy five different kinds of blocks since I started quilting. I’ve been quilting for many years so I have know idea how many finished and unfinished quilts. As far as blocks 900? heirloom! Of all the quilts I’ve ever made nothing has come close to this, thank you designers. Too bad I can’t attach a photo, when I shared the quilt at my quilt guild the response overwhelming. I am a huge Blockhead. I would guess the number of quilt blocks I have made is in the thousands! Love the book. I have been quilting for about 7 years-I think I have made over 100 different blocks. Thanks for having the giveaway! Not all of my blocks have made it into finished pieces, but I will have to go with somewhere in the hundreds. I’ve made 100,000s of quilt blocks! I love the Blockheads! That’s a hard question, but considering how many block of the months I have done, I’m gonna say 150. Thanks for the opportunity to win. I’m only a partial blockhead at the moment, but I’m striving every day to become a bigger and better blockhead. Maybe more than eleventy five. I’ve only been quilting for about two years,and have made around 300ish blocks! But, I love it and am aspiring to make MANY more!! I take care of my three young granddaughters(as a widowed grandma) so I quilt on a tight budget. Winning this would be a wonderful blessing! I’m definitely surely a blockhead. I have no idea how many. I’d guess a few hundred. Hmmm. Maybe 100. Or 1000. Lots. I love being a blockhead! Just guessing but maybe a 100. My best guess is close to 55-65. I have 30 grandkid and have made a few other quilts besides theirs. All different. More than one block per quilt though some have similar blocks. Maybe more with the ones I have done on dear Jane. I’ve made over 1,000 quilt blocks over the past 20 years. This past year I made several Kim Diel quilts using patterns from her Simple Whatknots book. I use little quilts to decorate my house. Quilts seem to add comfort and give my home a “homey” atmosphere. I have only been quilting for just over 4years so my tally is small (in comparison with others), I guess I’ve made about 80 / 100 quilts. This includes baby & wall quilts. I’m almost addicted, I have a good stash of fabric, & a small pile of tops waiting for me to "quilt"
It’s hard to say how many different quilt blocks I’ve made but I completed the 365 quilt and the Etoiles Rouge so that’s already over 400. I’ll say about 500. As for the Blockheads, I love collecting the patterns and I have faithfully downloaded the blocks. Thanks so much for the inspiration ladies. One day!! Yes I have never counted them all but I have made several block of the week projects so I’m guessing at probably 200 different blocks. I am starting a block of the month project after Christmas with my guild. I would LOVE to win this book and fabric bundle as I have a love of Moda fabric and really want to do a Cicil war quilt! I really can’t imagine how many I’ve made in 40 years of quilting. My best guess would be several hundred. 😊 Thanks for the chance to win. Probably approaching 1000 different blocks – been quilting almost 30 years,and have made many sampler quilts! I honestly couldn’t even guess. But I know I will make 48 more because I love this book! Thanks for the chance to win. To answer the question of how many "different" blocks – I would guess around 50. I have made over 300 quilts so to guess the total number of blocks would be almost impossible. I am always looking for new different blocks to add to the number. Variety is the spice of life! I have probably made several thousand, since I have been quilting since 1979. I’m only guessing because I’m fairly new to quilting but I would say 30+ different blocks. I love the colors in the fabrics chosen. I can’t even venture a guess at how many blocks I’ve made over the years. I do know that my first block was a Log Cabin and all these years later it is still my favorite block, in fact, I just made some small log cabins this week! Love trying new blocks and thank you for a chance to win this book and all the lovely fabric! Wow! I think I’ve made 500 and I’ve only been at this for 7 years! During the last few years, I have made several samplers and participated in block exchanges in my guild. Just in that time, I have made at least 80 different blocks. Over my quilting time, there are too many to count. I really enjoy trying new blocks for my projects. I have only made a few, I am fairly new to quilting! Hace tiempo que hago bloques ….y nunca los conté , no podria asegurar cuantos pero si podría decir que cada uno de ellos tuvo mi atención ,mi amor , mi pasión por el patchwork y sobre todo una partecita de mí. Me encantaría ganar ese precioso libro y telas para seguir aprendiendo.Gracias!!!! Translation: I have been building blocks for a long time … and I never counted them, I could not say how many, but I could say that each of them had my attention, my love, my passion for patchwork and above all a little part of me. I would love to win that beautiful book and fabrics to continue learning. Thanks! Good question! Probably several hundred. Can’t wait to get this book! I’ve probably made thousands of blocks! I would love to win the book! I am sure I have made into the thousands, but would not know an exact amount. I have been making quilt blocks for over 40 years. Does that qualify me for the "blockhead" moniker? I tend to do scrappy sampler quilts, so I would guess several hundred. I have about 5 under my belt. I would love to learn more. Wow – what a question! Between pieced blocks and appliqued blocks, my guesstimate would be around a thousand. What a great giveaway. 250 or more would be my guess. But then I think about the ones I’ve never put together into a finished top. That would put it over 350. I really enjoy sampler quilts, where each block is different. Our guild has had a block of the month a few times. With that said I would say approx 100 or more if you include my own quilts. Several dozen different blocks at least. Well in the last three years I have participated in at least 6 sew alongs including the Block head SAL. I estimate in that time I made around 350 blocks for that purpose only. I also sewed another 4 quilts containing 20 blocks each. That is a lot of blocks. I’ve been quilting 30 yrs. I think I have made well over 100 different quilt blocks. .i enjoy making sampler quilts and scrappy quilts and those could easlily have 20 to 25 different blocks. Come to think of it, it might be closer to 200 different blocks. My guess would be probably about 150 blocks in my 18 years of quilting. Thank you for the opportunity to win this lovely bundle of fat quarters and Block Heads Book. I have no idea, haven’t kept track of anything but since 1990 it has been a bunch, and as the years go by, I am doing it more and more, and smaller blocks and mini’s. Maybe 5-600 blocks? I don’t know. Not counting, just enjoying the process and trying to get things finished. Oh my gosh, I don’t think I can even imagine, but I’m sure well over 1,000, maybe WELL OVER. LOL But hoping for thousands more. Made my first quilt in the 70’s so I have probably made at least a hundred over the years. I have made many sampler quilts and traditional quilts with a variety of different blocks. Guesstimate would be 100+. I know there are so many more awesome blocks out there. I would love to win this book and fabric and try to make 100+ more!!! I’m just getting going, I’ve made about 200 blocks. I love making the variety of Block Head blocks. Lovely blocks, book, and fabric! I’m reentering quilting after a 35+ year hiatus. I’ve no idea about then but this year I’ve made at least 25. It is very hard to estimate, but since I have completed several sampler quilts I would guess that I have made at least 75 different blocks. My experience with blocks was limited until I stumbled upon the awesome modaBlockheads. Let’s just say it has become an obsession. Love the designers inspiration and the group comradre as well as techniques shared and learned. Truth be told, perhaps just over 300 blocks to date. I love working on itties and hexies and now sampler quilt blocks. Thank you Martindale and moda for this awesome opportunity. Gosh, no idea! I love all the personalities of different blocks and the names given to them. Quilters are blockheads and artists! This book is beautiful! About 42. Just started back into quilting after a 20 plus year hiatus. I wonder now why I ever stopped. It’s so relaxing to sew and create something. I have been quilting for over 30 years . I don’t have a clue how many hundreds of different quilt blocks I have made . I guess that makes me a blockhead . I’d say maybe 200. Most of my quilts are samplers. Mabybe 200 blocks. Love changing it up for each challenging and exciting quilt! Thank you! How many different blocks? Maybe 20–I keep going back to my favorites. I could’nt begin to count the number of blocks I’ve made in 30 years or even in the past year, lol. Jan Patek’s quilt is on my list to make! She’s my FAVORITE designer! Thx to all the designers! I have been quilting for several years – estimate over 200 blocks. I have enjoyed the blockhead series. Thanks to the designers for their inspiration. Wow! I’ve been quilting for over 20 years, so I know it’s a lot. I would have to say well over 100 anyway. Gorgeous quilts! Only a handful … something like 5 or 6. I have probably made about 12 dozen different blocks in the years I have been quilting. Hope to make many more. Can’t imagine. I’ve made several sampler quilts. I’ll guess 500. I think more! I have made so many different quilt blocks over the years it would be impossible to count – and loved them all! Oh my…probaby 1500. Ive been quilting for a long time…30 years or more. Thats my favorite part of quilting is making the blocks. I started making blocks 40,or so, years ago and since I retired my production has gone up–maybe a couple hundred? I would like to say…HUNDREDS! Tough question! I would guess 100+ different blocks. Just a budding blockhead! But have drafted block patterns for friends who think it’s too hard! Simply love quilting and have done some of it..favorite part is stitching it together and the quilting..The best kind of therapy! 300 plus and plan to make many more. Most of the charity baby quilts that I make are quilt blocks. I may have tried 2 or 3 dozen patterns, but usually gravitate toward a snowball 9 patch combination. Oh my, I have no idea. But several dozen at least! I have only made about 15-20 different blocks. I feel like a novice! Great inspiration in the Block Heads book!! I’m a beginner blockhead but I still think I’ve made at least 25. I roughly guess about 100+ different pieced and appliqued blocks. I’ve made maybe 40 different block patterns if you include applique. I love this type of sampler quilt. After making a king sized bedspread last year with a 2 block pattern, I appreciate the variety of a sampler! Not sure how many I’ve made 🤔maybe 1,000+ = but have loved the process. My grandchildren love their quilts and have stared to join me in the sewing room – might have start to tally their blocks. Several hundred, to learn I started out making sampler quilts to really perfect my first ability to piece a top. I have probably made around thirty- five different blocks. This is tough! I have been quilting for 27 years, so maybe 600 blocks? I have no idea! Number of blocks…probably to many to count. I have been quilting for 20 years. I did the ModaBlock Heads #1/2017 now just have to quilt the top. I did the quilt in red-white-blue reproduction fabrics. I am a civil war fabric lover true to heart but enjoy any and all fabrics. I would love this book to pass onto my mother who got me hooked on quilting. I thank her every week during our phone visits! I am loving Blockheads 2018- excited every week to get my pattern. I would guess about 300-350!!! I have made many sampler quilts. In the hundreds. I have been quilting for about 48 years. Love Lynne Hagmeier’s on point setting and her beautiful Fresh Cut Flowers fabric !! I’ve been making quilt blocks since around 2009. I am constantly making them in order to try new techniques and patterns. And it’s gotten more so since I learned how to paper piece 3 years ago…the cool patterns are endless! I love making blocks so I probably would have to guess at least a few hundred up to a thousand? Oh gosh! 50? No clue! I can’t even imagine, but there’s lots more to do! I’ve made about 300!! Thanks for the opportunity to be a winner!!! During my life prime as a quilter, I have not made enough , and am always craving to make one more. What a great question! Been quilting for 25+ years, but I tend to be repetitive…so I am going to guess low, 175-200…did some of the blockhead blocs, what fun…I do these for a break from making a larger quilt, and the applique ones, I can take to places I might have to wait! Great fun! Thank you for such a wonderful give-away! I’ve made about 100. I started quilting about 7 years ago and am very slow but I love each one I make and think the last one I made is the most beautiful. I would love to make a few of the wonderful blocks I see shown. Thanks for the opportunity. Oh dear..I should have kept track. I would think over the years it would be in the 500s I am a senior so have been quilting for a lot of years and loved every minute of it. What a lovely prize for the lucky winner! Thank you for the opportunity? I haven’t been quilting long, I started 3 years ago, but I participated in the Splendid Sampler with Pat Sloan, and have completed 20 quilts so I am thinking I have made around 180+ blocks, I love doing samplers and have followed along and saved the block head patterns and have them on my list to complete. I have probably made about 40 different blocks. Not as many as I want. But I went to nursing school in my mid forties, and didn’t quilt during those 3 years. I’m playing catch up now! At least 50- always looking forward to the next one to try. My very conservative guesstimate is around 150. I use the Log Cabin block a lot and other blocks are variations of each other. Count me in. I probably have made more than 5,000, and have saved all the blockhead blocks. I am a visual learner and having the patterns to follow in a book will be awesome. Looking forward to getting started. Thank you for the chance! Thousands of blocks–too many to count or even guess at!! It’s so fun to see all the quilt setting from the designers–very inspiring! My guesstimate is about a thousand! I can’t even begin to count the different blocks I have made. I know it has to be over 500, but it could be closer to 1000. I have no idea how many quilt blocks I’ve made over the years, but I have enjoyed making them. Thanks for the opportunity to win a copy of this book and the great fabric pack! I have only been quilting for 7 or 8 yrs so I estimate 25 or 30 different blocks. Thanks for your awesome give always. Hope I win. I love piecing blocks and guessing I have made several 100. It’s always fun to see them come together in your own fabric choices. assorted blocks for quilts must be in the thousands. I am happy to say only a handful were unacceptable. I would guesstimate about 500. When using panels or just playing I use books to make new blocks, I don’t like the same thing over and over. I’m really hooked on star blocks, but my guild did a challenge of no less than 20 different block samplers so it upped my exposure. I’d guess i’m at about 175 different blocks. Of course I’ve been quilting for almost 40 years, so its not that impressive a number! A wild guess would be 75+ different blocks. This book gives me inspiration to try new blocks. I love to quilt. I love to sew. I think I’ve made about 23 total quilts so far, and have about 6 UFO’s. When I get in that sewing room, all the world’s stress just melts away. Love the Blockheads book and the fabric. I could have some fun with that. I have only been quilting for about 2 yrs, but I’d say probably around 100+ blocks. I was addicted to quilting immediately LOL! 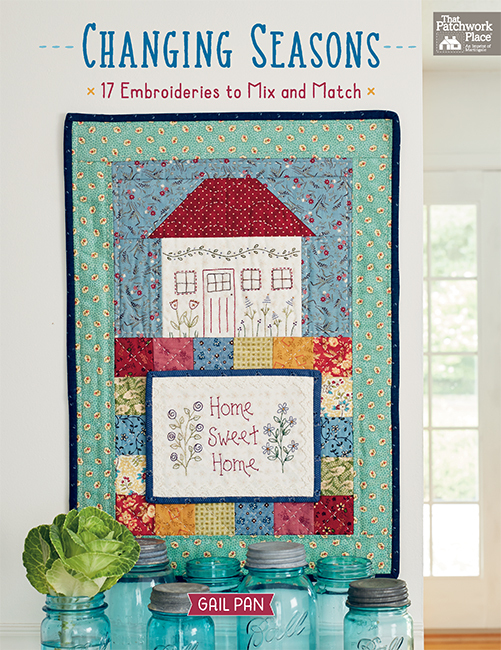 I just love making sampler quilts and it’s a great way to learn new skills so this book would be perfect. 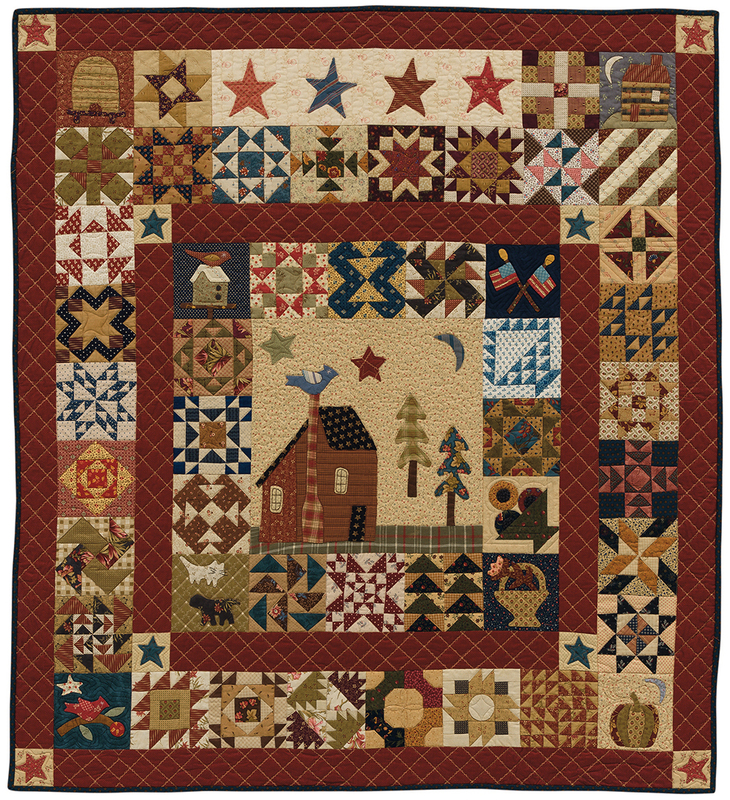 I am also a huge fan of Lynn’s and Kansas Troubles……beautiful, beautiful fabric! I can’t answer that guesstimate??? I’ve made too many different blocks to count. I did start printing the patterns for the Moda Blockheads, but never got started. I would love to win the book and toss the printouts. 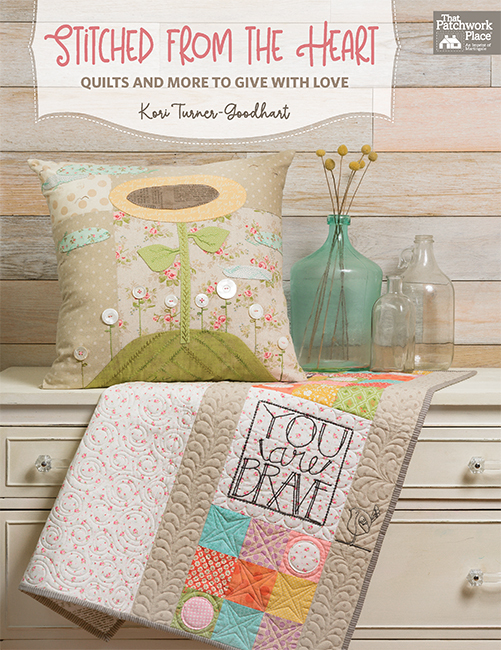 I’m a BIG fan of Kansas Troubles and would love to add this bundle to my KT stash!. In over 30 years of quilting I can’t even come close to a number. Some I have loved and some i have hated. Many I agonized over but each block taught me something and hope I continue to try a few hundred more new blocks. I have finished somewhere between 500 and 1000 blocks. Still have tons more to go! I would estimate that I have made 250 different blocks. I am 69, and the first quilt I made was at 10 years old. So 59 years of quilting equals lots and lots of blocks. I favor Sampler quilts and miniature block quilts. So I would guess hundreds of blocks! Maybe 1000 different blocks, though probably more! Wow! Never thought about it as "number of different blocks!" Staggering! It has been fun but hopefully I will have some more years for this kind of fun! Well, I was going to say 100. Then I read through some of the comments and got reminded about my Dear Jane quilt so I am upping my guess to 300. My first quilt was a Sampler started in 1978. Still quilting everyday and love my craft just as much as I did when I started. I’m guessing at least 500. I’m obsessed with BOM programs. (Ask me how many I have in progress?–lol). I love sitting down for an hour or so and just playing with fabric making a block. I also like to play with all the different methods of piecing. OMG! I cannot reasonably count how many blocks I have completed in my quilting life. But I do know that I am a blockhead because I am working on Blockhead 2 blocks after not completing but collecting Blockhead 1 patterns. So, I guess you can call me a Blockhead! I couldn’t even begin to count as I’ve been quilting for 25 years. At least a couple hundred plus lots of appliqué. I can’t even imagine how many blocks because I did over ten years of 2nd Saturday quilts–at least 12 blocks plus and one Christmas when I made 6 ten to 12 block young kids quilts for my great nephews and nieces. Then there are the 3 quilts for my 2 sons which were full sized. One was a lone star and the other a storm at sea which had about 40 blocks. My first quilt was in 1980–Overall Sam, 12 blocks, for my 3 year old son. Actually I can’t really know how many when it covers almost 40 years of quilting. So I’m considering myself a very happy "blockhead". I’m not sure but I’ve done block of month quilts for years plus lots of over quilts so I’d guess maybe 400 – 500. I love seeing the way the different blocks come to life. Well, I did block heads, plus 222 for splendid sampler plus a bunch of others, that was just the last two years, I would guess at well over 5000. Probably hundreds. I’ve been quilting a long time! I have made many if i had to guess a hundred or more? Been quilting off and on for years! I totally love all of these designers in this book BLOCK HEADS!!! I did do a bunch of these blocks but life got in the way and never finished. Would love to win this book and fabric in order to get them done! Hard to say. Maybe 100 or more? I have participated in several Saturday Sampler quilts at my LQS and there are usually 12 different blocks I haven’t done! I’m guessing 200+ different blocks. Hard to say – it would have been clever to keep track! By ‘different’, do you mean from different fabrics, or different sizes, or different patterns, or something else? In other words, if I made a 6 inch Ohio Star, is that different from a 12 inch Ohio Star? Or if I made 12 Ohio Star blocks, but they were scrappy, would they all count as different? Or do I count every time I’ve made an Ohio Star block as one quilt block, and every time I’ve made a 9 patch as another block, etc.? Maybe I’m being too analytical, LOL! I get accused of that a lot! I couldn’t guess how many blocks I’ve made. For years now I have been assembling a notebook of block designs and the various names each goes by. I’ve also been collecting the blockheads rounds 1 and 2 to put my stash and scraps into in the new year. Surely would love to win this book and the gorgeous bundle. Love what you’ve been up to Martingale. Thanks for publishing so amazingly on our behalf. Bless you. I’ve been quilting for over forty years and have no idea how many quilt blocks I’ve made, hundreds if not several thousand. I plan to make many more. How many different? A lot! Was in a guild that we did friendship blocks; one month alone we had 14 new blocks. Each month more were added to the selection. The great thing about this is variety, learning new and different block construction and better sewing skills. Since I’ve been quilting over 30 years, I’ve probably made close to 100 different blocks. Thank you for the opportunity to win this fabulous prize. I’ve been quilting for more than 50 years and have made several quilts but not too many samplers. I would say way into the hundreds. I love the book and fabric and would love to win. Most of the time I draft my own patterns. I learned that early on when there weren’t very many patterns out there. I need to get a life but I love to sew. I cannot honestly tell you how many blocks I have made. I have sewed for all of my adult years but got into quilting in my dotage and have made quite a few different blocks and had much fun doing most of them. I am specially fond of repro fabric and blocks of that time-line. I’ve been quilting over 12 years so I would say in the 1000’s. I quilt a lot to give other people and was in a guild that made quilts for needy folks. It’s a blessing to give them away! 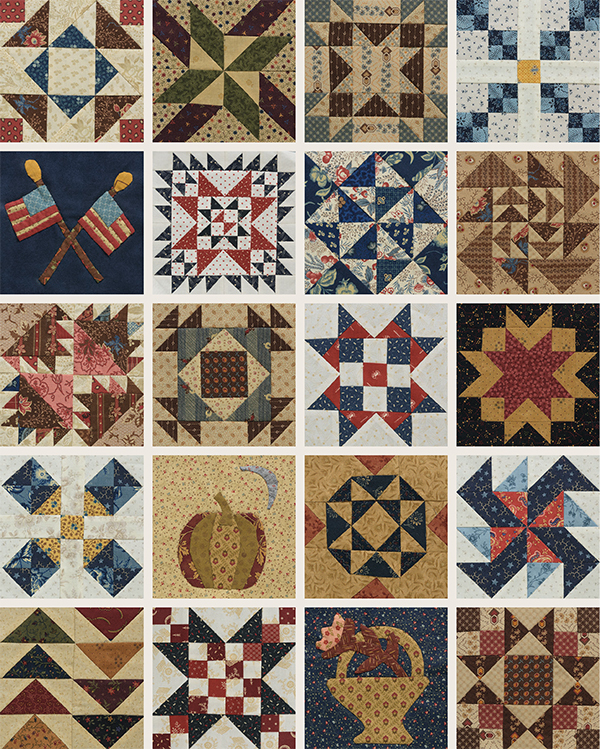 Different quilt blocks: pieced blocks – more than 100, applique blocks – about 100. Just guessing. I’ve made hundreds of blocks in 20 year career. Some were part of a quilt while others were part of “being creative “ and used in many different ways. I’ve never considered counting the many different blocks! Wow! I’ve been quilting almost 40 years, made several samplers as well as one block quilts. I’m afraid I’ve run out of fingers and toes, including my husband’s. As a new quilter, probably 25 different blocks – with more to come! Around 100 blocks, I can only quilt during my vacations. Thanks Moda Fabrics for inspiration. Oh my! Too many blocks to count over the many years that I have been quilting. Each one crafted with love. Eager to try my skills with the original Blockhead blocks. What a great giveaway. Around 100 blocks. Thanks Moda Fabric & Designers, It´s always inspiration. Well, I’m little bit careful and like to make easy blocks. So I have made maybe 20? That’s an interesting and impossible question! I would have to guess at least a couple hundred! Looking forward to see and learn about these beautiful blocks! Well… I am a newbie in training…but thanks for the chance to win! Wow! What a question. I have made several sampler quilts plus many others that use the same block. I am going to guess about 200. I would really love this new book to add to the list. I guess it would be a good idea to sit down and count them all some time – when I am not doing another quilt!!! Can’t even guess really–but I will 200. This made me really think, which is not easy when you just wake up! Let’s see! I’ve probably made 100 different blocks since so many times you are repeating blocks in a quilt. I have always been a "Blockhead" but didn’t know it. I’ve probably made 250-300 different blocks in the many years spanning my quilt making. Samplers are great as you can practice a pattern and then decide if you want to make more for a larger quilt or use one or more blocks for something small. What fun! When I think about it, I have made more than I realize. However, I still feel like a beginner because there are so many I have not made. I haven’t been quilting for very long, but I think maybe 15, 20 with variations for each one. Certainly ready to try new ones! Another who has made several hundred different blocks! There have been a bunch of sampler quilts over 40 years of quilting and probably 300 quilts or more in all of those years!! My first quilt was a sampler with 50 State Capital quilt blocks, so you can imagine that the total has only gone upward from there! Since I have only been quilting less than 2 years I think I have made approximately 3-6 dozen different quilt blocks. I enjoy trying new ones. Moda fabric is my favorite!!!! I love your website too! It gives me a lot of ideas. I have no idea how many different blocks I’ve made over the years, but I need inspiration! This book sure would provide it! Love ALL the designers! I have probably made 150plus blocks, not as many as I would like to make. Thanks for an awesome giveaway. To be the lucky winner would make my day! I have made about 60 quilt blocks. How many blocks….do fusible applique ones count? Maybe about 100 or so over the years, I’ve been involved in other arts/crafts and have only recently started focusing on quilting. I’ve been excited to see this book, it’d be great to win it! I have made hundreds of blocks and am ready to make more! I’ve made millions of blocks, but probably less than 100 "different" blocks. I have my favorites and tend to go back to the same few I have perfected. Goodness! Well I know for sure I have made 111 bed quilts and each of those took at least 25 blocks apiece. That is 2775 at a minimum. Plus all the table runners, tote bags and small projects each year add in about 4-10 blocks each. I would guess conservatively another 150 blocs there. So my guess is 3000 or MORE! Yes, definitely more since I am still working on a Dear Jane and 5 of those bed quilts mentioned earlier were Block of the Week Mysteries and pretty intricate. Oh boy! I have been quilting for over 50 years so I have made a lot of blocks. You did say different, I know I once worked my way through a book of 501 so I have made at least that many. Wow that alone sounds like a lot of different blocks. It can’t possibly be more than 30 since I began quilting in 1994. I have favorite blocks that I like to remake over and over. My guesstimate is 400-ish. My very first blocks were all hand pieced but I’ve moved on to machine piecing. Putting together a block is therapeutic for me. I love the colors and feel of the fabric….it’s my happy time. I would say at least a thousand, including the Tula Pink 100 block sampler. My GUESStimate is 70 different blocks. Most quilts have the same block, and I don’t usually repeat many quilts do that’s my best guess. Hundreds! started quilting when I was 18, and now I am 61! Oh,I’d say about 25 different blocks, I’m still working on learning different techniques to get those more complicated but beautiful blocks, when working on a quilt many are repeats but boy would I love to do the blockhead quilt. I actually signed up but time got away from me, maybe next time. I made my first quit 50 years ago when I was in high school. Five kids, 21 grandchildren, and dozens pot baby showers later I have no idea how many quilts I’ve made let alone quilt blocks. Since most of my quilts have involved one or two blocks my wild guess would be 40. Too many to count and I still am making more blocks! Love the variety different blocks give you. Keeps me interested in doing them. To win would be divine. If you count all the 1-block pot holders I’ve made – it must be over 100! I’d love to make one of these sampler quilts. This is a hard question. Probably almost 50? My guesstimate would be only 100 different blocks or fewer. I have some favs I keep going back to. Oh my! Hundreds of quilts now – must be hundreds of blocks as I am always looking for something just a little bit different. I’ve probably made no more than a couple dozen (easy) blocks. 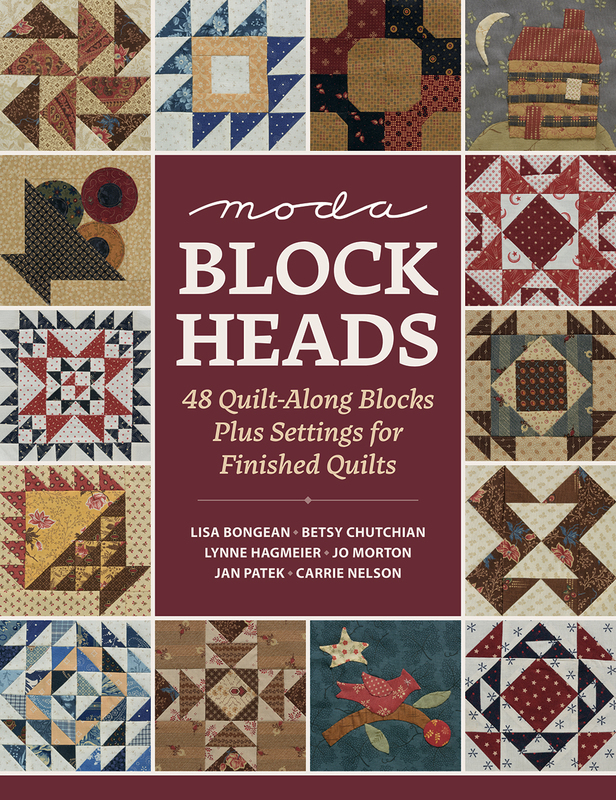 I’m ready for a challenge and think Moda Block Heads would be just the thing to get me going. I’m going to say over 100. I like to make mystery quilts and mystery blocks of the week/month. Love this year’s BH2! Maybe 25 physical ones, but THOUSANDS in my head. I have made about 30 or so different blocks not counting applique stuff I come up with on my own. I signed up to participate in a block-a-long at JoAnn Fabrics in a few months so I’m excited for that. I’d love to win! Thanks for the chance! I think I’ve made well over 200 blocks. I enjoy the challenge of new things. I’ve even designed a good number of them myself. Thanks for the chance on your wonderful giveaway! I started sewing quilts at age 11, and 27 years later I’d guess I’ve made about 75 different blocks. I love sampler quilts, and this one is on my bucket list! At first thought less than 2 dozen, but then realized it’s many more than that since the last few years have been mostly sampler quilts. Probably 75 or more! Hundreds! And looking forward to hundreds more! Hundreds? Thousands? Besides the quilts I’ve made (since the 1970’s! ), I like to piece test blocks to keep track of ideas. Yeah, I’m a Blockhead! Really? Has anyone a precise idea of how many blocks he/she has made!!! Well, that would just be a guess for me and I have difficulty deciding between hundreds or thousands! Well, what I can say is that I have more pleasure hand-piecing my blocks. 1000’s I love making samplers and every block is different in those quilts! I am relatively new to quilting so I guess maybe around 20. This would be a great book to help me improve and the fabric would be fantastic. Hundreds. Have been quilting over 30 years. I would guess that I have made at least over 100 different blocks. 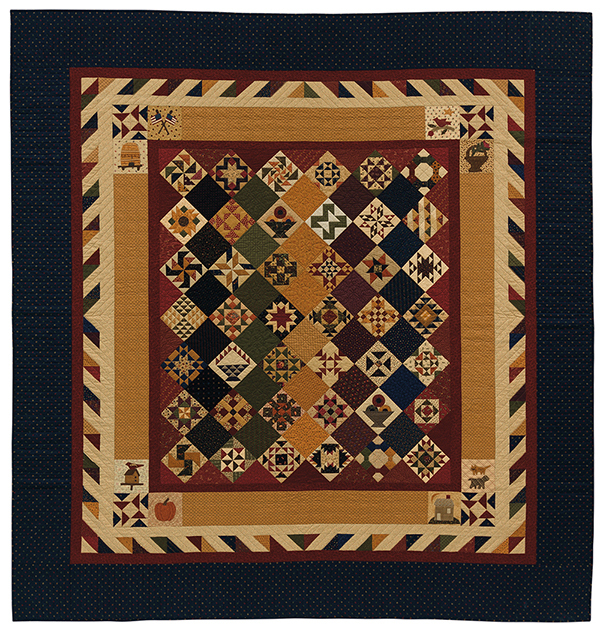 The sampler quilts you have shown are beautiful. Wow, 25 years of Quilting, hundreds of patterns, cannot guess but let’s say 100. Love Quilting and love Moda. A few hundreds? I guess. I love to make different blocks and sampler quilts much more fun than I one-block only quilt. Wow, I started in July 1981, 37 years ago. I think a conservative guess would be 250. I haven’t been quilting that long so not that many…maybe 30 or so. I have saved all the blocks for Blockhead 1 and Blockhead 11 as they come out. Hope to get started on some of them soon! Have not been quilting too many years but I would guess probably 75 different quilt blocks. I have fabric and patterns for hundreds more quilt blocks to do in the future. I am a total blockhead! I would have to estimate over 1,000 blocks and there are lots more to come. Thanks for the giveaway. From my microbiology colony count days, TNTC-too numerous to count. I can think of 450+ just this year. I love blocks, orphan blocks,Farmer’s wife blocks,cross stitch, etc. I,m only just starting my quilting journey, having sewn garments for over 50 years. So I,ve only made up two patterns of blocks. Looking forward to thousands more! Easily over 100. Miniature through 12.5. Since I’m a relative beginner, I’ve made about 115 blocks so far-but given time, I’ll make that many more! Another great giveaway by Martingale! My guess is that I’ve made about 500 blocks, at least. multiple hundreds? In the last 5 weeks I have made 26 blocks, all different, Most are patterns I had not done before or variations on patterns I have done before. I love variety so I tend to make each block unique in either pattern or fabric choice. Hundreds. I guess. There are favorites though that always seem to circle back around. I’ve made hundreds of blocks, or maybe thousands. Each one special, or at least I thought so at the time. Lots of stars, because like most I love them. Different blocks?? Probably 100. I love to experiment. Too many to count, 1000’s? I love samplers. The variety is endless. Beautiful quilts gals! Thanks for the Giveaway! I’m sure I’ve not made as many blocks as these talented women from the book or those that have responded to this contest. I’m new and still learning! But I do love to try!! I don’t know!! Between personal projects and bom programs, shop hops,it’s got to be in the 100’s! And I can’t stop! My guesstimate would be less than 50. Since I have made hundreds of quilt projects perhaps a hundred blocks or more. I have no idea!!!! I’m a teacher, I’m always trying a new one!!! I guess the number would be in the hundreds, but it could be more. There are some really great blocks in this book. Thanks for the chance to win! In the 100s I’m guessing. love love love sample quilts. Would love to win this give-away. Not nearly enough!!!!! I actually started this quilt back when we were doing a block a week but I had to set it aside for now. I thought what a great opportunity to make a bunch of different blocks that I have never made before!! It is definitely on my bucket list to finish this quilt! I’d say 100s but who really knows!? I have probably made over 400 blocks, since I taught beginning and intermediate quilt making for more than 15 years. I love samplers because you can try lots of blocks and techniques. I have probably made 75 different blocks. Many of the quilts I made use several of the same block. Would like to try a sampler quilt though to make more different blocks. Probably only a couple dozen. This would persuade me to do more. I guesstimate over 1000 blocks! But who counts them? Hahaha! I would love to win this bundle. I really like Jo Morton and Lynne Hagmeier’s styles of quilts. I’ve probably made 8-10 different quilt blocks. I’m not sure! Do mistake blocks count too? Probably 100. I’ve only been quilting for 5 years. Haha thanks for the giveaway! I think at least about 200 , over the last 7 years!!! I hope to sew hundreds more!!! I haven’t made that many quilts yet so probably 5. I absolutely love collecting patterns for quilt blocks and constructing them. I like the idea of using my stash to make them. I also love the idea of a fabric give-away. A quilter can never have too much fabric. I have made probably about 250 different blocks. Love your emails! And your books! If only counting different blocks, my guess would be 200-300. Now if we were talking TOTAL blocks, that’s a very different story! 🙂 Love quilting and trying to put my own spin on each quilt, just like these ladies are doing. Awesome job! 800??? Totally a guesstimate! I have only been quilting 3 years.- but I’m hooked!!! Really guessing – maybe 30, maybe more. Great question! I want to make as many different blocks as life will allow! Bring it on. Love the blocks and the fabric is beautiful! Thanks to all of these great designers. Haven’t made that many. Could be about 59. I haven’t been quilting for very long but I would say I have made about 100. I plan to make many more as soon as I can.Thank you for the Giveaway! I would love to win. Translation: I made the diamonds from Linda Frans so really many different blocks. Fabric is lovely. Probably over 1,000. I’ve been quilting over 30 years and have enjoyed every minute. Loved doing the moda block shuffle. Several hundred, for sure. Depends on whether one is counting all blocks or just blocks that are each different. Just starting to become addicted, so only a small number of 10 so far . Life keeps slowing me down! Somewhere between 50 and 100. I am fairly new to quilting, so every book is inspiring to me and with new fabrics to boot. I would be so very thrilled to start learning new ideas with beautiful fabrics to match. Thank you for a fabulous opportunity. I have probably made 100 different blocks. I do love making different blocks as opposed to the same block several times. The book sounds wonderful. Thank you for the opportunity to win. Hi,I’m a new quilter, so maybe only a dozen of so! I love the Pinwheel Block and keep returning to use it, so my number may not go up so fast!Thank You for a neat and generous giveaway ! My best guess is probably close to 1000. I have made many quilts over the past 25 years with scrappy samplers being my favorites. I have played along with Pat Sloan’ s Splendid Sampler as well as the Block Beauties I and II. I’d love the chance to win this wonderful book and fabric bundle! I really enjoyed the sew along and am a huge fan of all the designers. I have been quilting for around 30 years, so I would have to guess my block count is over 10,000! I’d have to just guess, but maybe 40-60 or so. I love trying new blocks, but some that don’t appeal to me I just skip. I’m not much for appliqué but love stars and precise piecing. Ooops! I meant to put 1,000 not 10,000! I have experimented a lot with different blocks! I have probably done well over 150 different blocks through the years. I have been quilting for almost fifty years and have made a lot of Sampler quilts. They include Dear Jane, Farmers Wife(both versions), Sylvia’s Bridal Quilt, Loyal Union Sampler and many, many others. I would guess I have made hundreds of different blocks. Maybe even thousands. I would guess it would be around 100 or so. Variety is fun and I love to do sample type quilts, applique, and am now learning wool. So, the count will grow. Oh my, that’s difficult to say. At least a hundred different ones, including my own block designs. But I enjoy learning new block designs. I would guess I have only made around 50 different blocks. I’ve made hundreds and hundreds of different blocks. Some were put into scrappy quilts and some were made for my quilt guild’s special challenge block exercises. I’d love to win the fabric (as though I need any more!) and the book as I love traditional, scrappy blocks. The Blockheads Quilts above are beautiful. I have always been fond of samplers. I guess that is because my first quilt, a baby quilt, was a sampler. I hand quilted it and enjoyed it thoroughly. Hope to win this gorgeous book. I’ve been quilting a long time and have made several sampler quilts. However, I have no idea how many different blocks I have made. A guess would be at least 35+. I think over 300. I have spent a lot of time making blocks from Judy Hopkin’s quilt block book. I’d guess somewhere between 25 and 50. Thst fabric bundle is beautiful! Wow! Maybe 50 different blocks. Thanks for the chance to win this beautiful book and fabric!! Definitely a guesstimate, but I’d say well over 500. That is high because I do paper piecing as well as traditional methods. Oh my! I’ve been quilting since the early 70’s and have made many many blocks over the years. My guild and weekly sewing group are always making blocks to share and blocks for our comfort quilts that go to Hospice. I love doing diferent blocks and have made a few sampler quilts. It’s amazing to see how the same blocks are used to create quilts that look completely and amazingly different. What a great book! I couldn’t even begin to guesstimate how many I have made, to say at least 100 would be a small start. I have been quilting for over 40 years so the number may be lots and lots more. Thank you for the chance to win. My guesstimate? A thousand. I am proud to be a blockhead! Oh, let’s see…..since I love scraps and variety in the quilt, but do enjoy doing blocks over and over…maybe 50!! Thank you for a fantastic gift. Unfortunately, anyone awaiting a quilt from me discovered long ago that I’m more of a Blockhead than a quilt-head. Have made many, many blocks over the years but very few quilts along the way. My collection of blocks must number in the hundreds. I pet them every once in a while. How to define "different": repeated patterns? or distinct? The latter’s easier–say 40 distinct types. Hmmm….maybe 25 different blocks? I am not that prolific of a quilter. Love these blocks and Jo Morton fabrics! Oops! Sorry, I love the Lynne Hagmeier’s Fresh Cut Flowers fabric. I’ve been quilting over 50 years…. I love sampler quilts as well as applique! I haven’t made that many quilts so probably 5 or 6 of them. I’ve tried a sampler’s worth of blocks, and found a couple that I love. I tend to use the same block in different colors in different quilts. Even switching lights for darks makes the same block look completely different. It matters whether your asking about block patterns or each individual block made? I just know I have been quilting for forty years and some years I’ve made 2 or 3 quilts and other years 10 or more and then there are all the try this blocks and blocks made for donation quilts and… So who knows??? Interesting question. I would say 100 or more blocks. I’ve made far too few blocks so far! OMG! That’s really difficult to guesstimate! I’ve been quilting for a long time & work with a lot of guild projects, so I would have to estimate over 200 different blocks. I honestly have no idea, but I love going through my books to find new blocks to make. I really love sampler quilts! Gazillions, too many to count! What a wonderful book……so many choices on how to use the blocks! I think I have made maybe 6 blocks! I am just getting started on the blocks. I love them all and cannot wait to get Christmas behind me (projects) and start all kinds of blocks! I have given away 95% of the quilts I have made and haven’t kept track of the quantity. I will guess maybe 300?? This is a great give away, fantastic book and beautiful fabric. Thank you for the chance to win!! Sou brasileira e amo patchwork!! I have no idea – maybe 2-300? I try everything once! And then sometimes more if i love the block. If I had to put a number on it, I would guess it would be in the hundreds. This book I would love to own and the beautiful fabrics would be 🍒 on top. More than a hundred for sure! I will guess about 50 different blocks! Thanks for the giveaway! I’m guessing at least 100. I don’t know how many different block patterns I have done. I have not done very many samplers. Probably around 100 or so. I have probably only explored with a couple dozen quilt blocks! So much fun with so little time. I would love to learn more and thank you for the chance to win this Block Heads book and a bundle of "fresh cut flowers" from Lynne! Hard to estimate, over a 100 at least! The books looks fun & the fabric is wonderful! I’m a relative newcomer to quilting but I think I’ve made maybe 50 or so blocks so far in my quilting journey! This prize could spur me on to make that big quilt! And the fabrics look absolutely beautiful. I enjoy sampler quilts, so hundreds. I have no idea how many blocks I have made.I am slowing down as I age, but if I have to put a number on it I would guess 100+. The book is lovely but the fabric is gorgeous! What a question! I would guess around 150 different blocks, I tend to do a lot of repeats. I’m sure I don’t have an exact number, but I would like to know if any of the designers have given you an answer. Thanks for the wonderful giveaway. I’ll guess at 100 different blocks. This Blockheads book looks amazing. Oh my!!! There are too many to count. I have been quilting since the early 1990’s and have made countless quilts. I am guessing 200 plus blocks. Could probably count them on both hands – I’ve only been quilting about 5 years, and most often as others have said you make one or two blocks per quilt. An Irish Chain is on my list for 2019! I have only made approximately 128 different blocks but I am sure, with the aid of "Blockheads" by Moda – I will be able to make lots more. Oh My Goodness! I am a really BIG blockhead so I would say at least a thousand or two since I have been doing this for a long time. I am guesstimating here 200 or more quilt blocks and counting. I have been quilting for more than 25 years. I love trying new blocks. What a great giveaway. Thank you so much. My number is small, since even though I’ve made several projects, I’ve never made a sampler quilt, which really boosts the totals! : ) This is great inspiration to try one! Thanks for the opportunity to win this wonderful give-a-way! I have made hundreds of blocks in my thirty year quilting career. I love the look of sampler quilts and don’t know which quilt I would make first out of the six. I am looking forward to buying this book, if I don’t win the drawing!! When I stopped to think about it-if ra rectangle is a rectangle-then not more than ten if that many. I was suprised! I’m pretty sure I qualify as a blockhead, in at least two different ways. From being in quilt clubs for years, where we had to make a block as part of our project each month, it’s tough to guess but I’d say I’ve made at least 100 blocks and probably more. It’s fun to see each designers quilt – such different looks, but all beautiful. Thanks so much for the giveaway! Though I wouldn’t consider myself in the same veign along side with your excellent block head creators, I have created hundreds if not close to a thousands of blocks so far, though many were repititious, lol. I have an idea to implement along the "Moda Block Head’s" line so hope to create it in 2019. Thank you for all you do and that grand assortment of fabrics too. Since I have been quilting for 30+ years my guesstimate would be in the hundreds. Two to date. I’m new to quilting. Have recently joined a local quilting group so hopefully many more to come. I’ve never thought to keep track of them – I started quilting 5 years ago by doing BOM so I could learn, so probably at least 100, or more cause I love trying to make any block….. It would be in the hundreds. So far, I haven’t made many blocks. That being true, I still have one of my ultimate goals being to make a sampler quilt of all the different blocks I make over time! I’m sure it’s hundreds if I count all the pieced, paper pieced, applique & EPP blocks! Love Moda Blockheads! I would estimate in the 200 area! Around fifty. I haven’t made that many quilts yet. Oh my, over a hundred?! I’m guessing 246. Probably only made a couple dozen blocks. I haven’t been ‘quilting’ for very many years. I was a long time clothing sewer instead. I have just jumped on this bandwagon and love the Blockheads designs. I’ve probably made about 30 different blocks, in various projects. I suppose i’ve made thirty blocks. I love every new project and i like make different quilts and in the same time using patchwork and applique. Thanks. I’m not much of a blockhead. If you are referring to a count of unique blocks, I’ve probably done less than a dozen. Simplicity and repetition are my game. I’m a slave to 4- and 9-patches, tumblers, HST, etc. honestly, I haven’t made any but I have been saving and printing them for the last two years, and I am hoping to win so I can make them with the stack of fabric, thanks again, for making them so easy to read and understand. Gosh, I have done many sampler quilts and currently working on a 4 x 5 Anthology block which I believe is 180 blocks, Farmers Wife, and a lot of various quilt styles… so I would guess in the hundreds or more. I would guess probably 600. I made splendid sample so that Ed over 100. So far only a handful, I’m still learning and have fallen in love with quilting. I hope to continue, I love the creativity and the fabrics. I have no idea how many different blocks I have made in the 10 years I have been quilting. I have made over 100 quilts and the Farmer’s Wife and Dear Jane are UFO’s so I guessing 100 blocks more or less. Well I’ve made hundreds of quilts so I dare say that my block count is in the thousands, but I have no idea of an exact figure!! How many different blocks? Whew! I have no idea – 100? 200? I’ve been actively quilting since about 1978 … and owned a shop … and wrote three books on foundation piecing … and taught a lot of classes. I have no idea how many, maybe 100-200. I’ve been quilting for 20 years, time and blocks fly when you are having fun! I haven’t made many – I think less than 15 – as I started quilting only three years ago. I would love to have the opportunity too try my hand at more! Wow, that’s a hard one…maybe 150? I’ve really got no idea, but I love all of the Moda Blockhead blocks. I’ve been collecting them for the last 2 years online. Great giveaway, Moda. Thanks! Honestly, not that many blocks so far. I’m definitely a beginner! I’d say a couple dozen, but that’s going to go up soon as I’m working on my first queen size quilt! I have made more than 70 block types thst I can recollect, with many more to come I hope. I’ve been quilting for about 5 years and love making samplers so have probably made at least 300 blocks. I’ve done the Splendid sampler and a couple of samplers through my quilt shop. I’m currently working on a Lucy Boston POTC QUILT. I love the look of this book and would enjoy another sampler challenge. I have made over 50 quilts. How many different blocks? Perhaps 25 or so. This book will go on my wish list for sure. I have been quilting for more than 30 years and would really have no idea how many different blocks I have made. If I had to take a guess it would be somewhere in over 700. What a question….I’ve probably made fifty….no, a hundred….no, wait, more than fifty, less than a hundred. Why didn’t I take photos of everything? Thousands, I am sure! I have been quilting for over 50 years! I LOVE sampler quilts. I made Dear Jane, Nearly Insane and Quilted Diamonds to name a few. I just finished a quilt made of samples of different blocks. I never get tired of trying new blocks! So hard to know, I’m going with 113, but always happy to add more! I could only estimate…between 100 and 2000. I give all my quilts away including donation quilts. I sometimes wish I kept a photo and journal of them. Thank you for your giveaway. Love the book and fabrics! I made my first quilt n 1976! Each year I make more, now that I’m retired. I’d guess I’m a thousand-plus blockhead! I certainly haven’t made as many as I would like to!!! But hundreds come to mind, if not thousands and it always amazes me that there are sooooo many more to inspire me!!!! Good luck to whoever wins this bundle and book!!!! Love the quilts featured!!! I have no idea how many different quilt blocks I’ve made over the 40 plus years I’ve been piecing – but a lot! Wow, it’s hard to even guess. I have made lots of quilts though and have also been a pattern tester, so it’s bound to be in the hundreds. Making the blocks is probably my favorite part of the quiltmaking process. Just guessing, I would have to says in the 300s. I am always making a new block from a new book, magazine, pattern, or experimenting. I have at least 120 different blocks that need to be put into a quilt top. All12” finished. But haven’t kept track of all the other different blocks I’ve finished and given away. That’s a very tough question but I’ll guess maybe 50? Maybe I should keep track from now on. At least 100 or more. Never counted. I have followed several mystery quilts and others. Wow – what a great question…. I think around 150! tks! I have only been quilting about 8 years and have made lots of block, but have no idea how many I have made, I do know it’s less than most of my quilting friends! They are my inspiration! Well, I guess about 20? And I have just finished Dear Jane, if they count. What a thought to contemplate! Hundreds it seems like and have love almost every one! I have NO idea. Maybe 100 different ones??? Have hopes to keep on making them though. Would love to win this prize. Thank you for the opportunity. I am not much of a blockhead as I’ve only been making quilt tops for a couple years. I’ve maybe made 50 different ones. Thank you. At a guess, about 260 ish… Can’t wait to become a blockhead and try some different ones! I’m a big, big blockhead. I’ve been quilting for 18 years and have enrolled in a lot of BOMs and made hundreds of blocks. It would be a big guess – 150, maybe? 25-30 ish. Once I find one I like, I tend to repeat it for awhile in different colors! Best guess would be 350 to 400. Always like to try new blocks and learn new skills. Wow, that’s a good question. I started quilting in 1992, so even if I made only 10 blocks a year, that would be 260. If you count EPP blocks, add a whole bunch more! I am fairly new to quilting but have done several block of the months through my local quilt shop. My best guesstimate would be 125. I’ve been quilting for many years and could not even begin to count how many blocks I have made. What I love is there is there is always so many more interesting ones to make. My best guess would at least 2500 but I’d love to add these blocks to my total. I think 150+. I love to make different blocks. Thanks for the chance! 75. I did a lot of repeats for a while. Oh wow… just guessing, probably between 75-100 and have many more in mind to make! I’m still a beginner, and can only estimate, but I would say probably around 300? Quite a few , praying to make lots more ! I am STILL working on my Splended Sampler because I doubled the number of blocks I wanted. I’ve made 112 so far, all different. Who knows when it will end! Sampler quilts are my favourite and I’ve made several over the years, incorporating many different blocks (I can’t be sure how many but it would be in the hundreds). I love the challenge of a block pattern I haven’t tried before, and playing with new colour options to produce a unique result. To me, Moda Blockheads and Kansas Troubles are a match made in heaven!. Been quilting since 1986, so I would have to say MANY. Probably thousands! Still love the process of making quilts at 81 years of age. Lynn H. of Kansas Troubles has always been one of my favorite fabric designers. Oh dear, how many different blocks? Probably close to 60 as I’ve made quite a few sampler quilts. I have my faves of course that I make over & over but it may even be closer to 70 different ones. Would just LOVE to have this book! & Fabric! I’ve maybe done 40 – 50 different blocks. I’ve only done 3 sampler quilts. These look fun to try and the fabric is great. I’ve probably made about 20 different quilt blocks. I have probably made about 2000. I have not been a quilter for a long time, though I always wanted to be. Around 5-ready to expand my repertoire! I’m guessing about 75 but that might be too low. I make several baby quilts to donate each year, plus I belonged to a Jo Morton club at my favorite quilt shop. We made several small quilts during that time. I love quilts made up of several blocks and I think this book would be great fun to have. I wouldn’t even know how to begin to estimate! Many, many, many! Oh gosh! Hundreds and hundreds…not to say they all made it into finished (yet) quilts! Let’s guesstimate…1,200+ seems conservative. I love sampler quilts and have made over 800 different blocks, which I have mostly given away to relatives. I never got bored when making a sampler.Thanks for your contests. I have never kept count, but I would say close to 150. That’s a tough one … more than 100 but less than 200, I believe. Since I have been quilting for almost 40 years, I would guesstimate over 1,000, and that does not count all the repeats. I love the new Blockheads book. I have a fat quarter bundle waiting in my stash for just such a project. I have probably made 50-60 different kinds of blocks. I started quilting ~30 years ago, and worked on a quilt here and there over the years (finishing about 12 projects or so). I have recently gotten rejuvenated and finished several tops that I had in storage, started and finished another 3-4 and have 3 in process currently. I love working with fabric and creating beautiful works of art using it. I love piecing!Any excuse I can find to get the rotary cutter out makes me a happy girl. I could do a block day. I have been quilting for more than 30 years. Many blocks repeated, for sure. Guessing 150 or more. Several hundred blocks as I’ve been quilting for about 10 years total. It’s just sew much fun to sew and sew and make quilts for all the special people in my life and lots of community quilts for people who need them. I’m guessing about 65 to 70 different blocks because I’ve made a few samplers using 12 in each quilt and I count "kalideoscope" quilts as "one" block. The number is mind boggling. I’ll guesstimate low. 75+. Many of my own creation. Lovely book. That’s HARD! I guess I have made at least a hundred DIFFERENT blocks but hundreds of blocks (some the same-different fabrics) for all the quilts that I have made. I’m a newbie to quilting world, so my guess is 5. It has to be at least a few hundred as i have been quilting for more than 30 years. I try not to favor one over the other because i just love them all. Oh my goodness I am definately a blockhead as in the last three years following block of the weeks and block of the months I must have made over 300 different ones. Love them and all the learning that goes with it. My best guess is probably about 350. I make a lot of charity quilts and Quilts of Valor. I haven’t been quilting too long, but have made a sampler quilt and a few others. I would guess about 30 different blocks. Oh Wow! I’ve been a seamstress for 40 years but just started quilting about a year ago so I would guesstimate I’ve made less than 10. It’s completely addicting and can’t wait to try more. My favorite ladies are Lynne and Jo. They are awesome! I don’t even know how to guess but will throw out at least 100 different blocks. Wow, I have no idea! I’ll guess at least 100! Just a guess, but maybe 30. I really have no idea and cannot give a good guess. 50, 100, or ???? Great question! Now I wish I had kept track. Quilter for close to 20 years…I’d guess over 100! But I’m not done yet! Goodness, what a question! I’ve probably made well over 100 different blocks but I do use my favourites over and over. I haven’t been quilting that long, so I would guess that I have made around 50 different blocks. I love sampler quilts. Has to be well over 100. Have made many samplers and participated in a fair amount of block exchanges. Love to keep it varied! ♥️ just guessing … I have seen aprx 400 different blocks. At least a hundred. How many blocks are in a My Small World quilt? I have no idea how many blocks I have made and wouldn’t even try to guess. I do love sampler quilts and would be over the moon excited to win! Having started quilting in 2004 I would guesstimate at least 250 different blocks. I have made at least 100 different quilt blocks. I love sampler quilts! Oh my goodness! That’s almost an unanswereable question. I can’t even think of all that I have made. Guesstimating between 1 and 500? I’ve probably made over 200 different blocks. Thanks to the many creative people and their great ideas. My quilting life has been short! I’ve made 3 quilts and I’d guesstimate used about 13 different blocks. This giveaway is right down my alley! 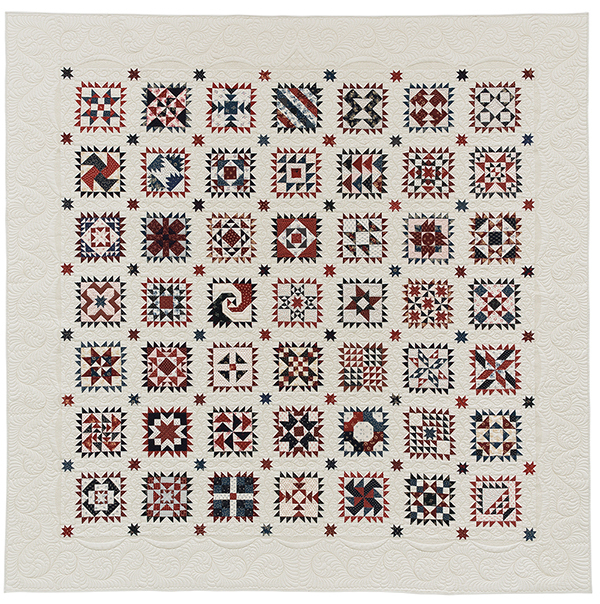 I was born on Veterans Day, so I love Lisa Bongean’s red, white, and blue quilt and my favorite fabrics are Civil War Reproductions! I’d love to piece Civil War Fabrics and make my own on-point wonder! Having the Book would be a big help in achieving that desire. Thank you for making this giveaway available! I’d have to guess that I’ve made several hundred different blocks. I did the Splendid Sampler and Tula’s 100 blocks plus all the blocks in our monthly raffle block at quilt guild. That might be a low estimate! Probably less than 10. I have found that I love hexagons! They are my favorite. I would have to guess around 100 to 150. I love making samplers. Thanks for the chance to win, beautiful fabric line. I honestly have no idea. I’ve made several over the years but never thought to count them. How do I even guess? I’ve made so many quilts, but actual different blocks? I’d have to say 255 (pure guess) since I’ve made two quilts with almost 100 blocks each. I have favorite blocks I make over and over, but I like to try new things and I’m a sucker for a sewalong. Several hundred for sure – thirty years of quilting, a 6″ sampler quilt in 2015 (50 blocks) and ten year’s of making every block in our guild’s monthly raffle contest so another 108 right there. The Blockheads book would be fun to interpret in modern solids or batiks. I suppose several hundred, but I’m not dead yet! I have no idea how many blocks I’ve made. I’ve been quilting since 1991 and have made many quilts but also when I find an interesting block I will make it just for fun. I have made so many I’ve lost count. Sometimes I just sew a block because I’m looking for something to do. Maybe 8-10? I’m a beginning quilter, so not that many. Wow, I don’t know. It must be at least 150 different blocks by now and I keep making different new ones. I’ve been quilting for about 5 years, so I guess I’ve made about 100 different blocks. Definitely a guess! I ran a block of the week on a yahoo group one time and have at least 80 6″ blocks made. I know I have made more than that, too, because of several BOMs that I did through a local quilt shop. I would say I have made at least 125 different blocks. I’m guessing 65, I may or may not be basing this guess on my age! Thank you. I wish I would have tracked all of the different blocks and quilts that I have made. I’m guessing several hundred over the last 30 years. Conservatively, I’ve made around 50 different blocks. This fabric group is gorgeous! And the book is filled with wonderful quilts! I love sampler quilts so I would guess I have made 100s of different blocks! But sill want to make more! probably 500 i would say starting out my quilty career with the ever-popular sampler…my favorite is still bow tie tho…awesome giveaway! I not much of a blockhead, I guess. I’ve made around 35 different quilt blocks. I like Jan Patek’s quilt the best. It has a lot of country charm. Maybe 50 since you are repeating a block in the quilt. I haven’t been quilting as long as many of the other quilters. I know I have made at least 300 quilts, no repeats, but three were samplers. Sooooo….I guess I have made at least 300 blocks. Whew, I’m tired. I have not made many. I make more with a total design instead of blocks. So, small blockhead. I know I have made at least 300 quilts, no repeats, but three were samplers. Sooooo….I guess I have made at least 300 blocks. Whew, I’m a tired blockhead. I’ve made too many quilt blocks to count. Quilting is my happy place! I’ve been quilting for a long time and would guesstimate 150 different blocks. I’m pretty new to quilting (only about 3 years), so my repertoire is still young but growing. I’d say I’ve made about 20 different blocks. I have no idea how many blocks I have made. I do not track this. I am sure that the answer must be in the hundreds. More blocks than I can count. Most are traditional blocks, a large number are blocks I’ve found ‘hiding’ in traditional blocks. These ‘Hidden’ blocks make designing quilts fun and exciting, and always something new just around the corner. I believe I’ve made over 600 blocks since I started to quilt, but I’m always planning on more! Have made lots of little Jo Morton quilts, so I’ll guess 100! I’ve probably made about 100. I love trying new blocks. It’s a great way to learn! I have been quilting since the 80s, so I have not even a guess of how many blocks I have made over the years. I think this book would be lots of fun to read and drool over and use! Thanks for the chance to win! After so many years and a few samplers I estimate I’ve made 317 different blocks. Thanks for the Blockhead fun! How many blocks have I made? Hmm, not nearly enough. I need to win! in all of my years quilting and making several sampler style quilts it would be in the hundreds. I’ve been quilting since late 80’s (with a break in mid-90’s to 2008 due to work demands) and have probably made approximately 80 or more blocks (mostly 12-1/2 x 12-1/2 blocks. One of my cousin’s quilt was made from just one REALLY big block (called the "Big Block" quilt). I am now trying to make a Mini block quilt. Smaller is not easier, but I like the challenge. I love all the highlighted designer’s quilt designs. I haven’t joined a BOM club, but this just might be my New Year’s resolution. For sure this is also a challenge in color design, too. Thanks to all the designers for their inspirations! I’m not sure, but I imagine 50 to 100. Beautiful book and even more beautiful fabrics! I would love to win! I’m guessing I’ve made maybe a hundred different blocks. Thanks. Beautiful fabric bundle. I think if I won, I’d make them all. I’m guessing about 1,500 or so. I just started quilting so maybe 5 different blocks. Sampler quilts are my most favorite to make. With good reason. I myself have only made 3 but those 3 were gorgeous. I absolutely love the variety involved. Oh dear! I’m not sure I can count them all. I have participated in many block of the months and made sampler quilts. I am guessing upwards of 300. I agree the book and fabric are a perfect match. Gosh, I haven’t made many — maybe 20. Wow. I started making quilts in the 70’s. It’s impossible to guess the number of quilt blocks I’ve made since then, but I’m still making them! I think at this point I have made around 60 different blocks. probably only 20; I need to get out of a rail fence rut (but it Is comfort sewing) and goes well with Kit Kat candy . Thanks for the chance to win! Hard to make a guess – 150, 200 maybe? I’ve been quilting a long, long time. But I always like trying new blocks. I am a newbie compared to some, probably 30 or so Quilts, and about the same on smaller pieces….thanks for the chance…. I haven’t been quilting that long so it has to be less than 10. Not enough!! But my best guess would be 25! I’ve probably made at least a hundred quilts. I am a retired OB nurse and made baby quilts for all the coworkers and doctors over 20 years plus those for family and of course myself! Wow such a fantastic, generous giveaway. I would not even know where to start to figure out how many different quilt blocks I have made. I think it is endless. Thanks for the giveaway. Since I have been quilting about 20yrs, I must confess I lost count how many different blocks I’ve made a long time ago. Some blocks I actually made enough to make a whole quilt! lol…but there are a lot of blocks I haven’t made, yet. That is why I would love to be the winner. I’ve made 400 or more as I like appliqué and usually did different blocks along with one each month when I was part of a guild friendship group. I also like Sampler quilts. Thank for the chance to win. Its difficult to remember, but I would guess about forty. I haven’t made that many quilts yet. I have been retired 5 years and have been quilting some of that time. Love this fabric and would love to use it to make a quilt using blocks from Moda Blockheads! A guesstimate but I think well over 300. All my favorite blocks are in this book! Thanks for the fun! How many? Oh my….100 … not maybe 200 …. and after this year most likely 300 as I love to do samplers!! I have been quilting for about 45 years……my number of blocks must be in the hundreds! So much fun and so many to do yet! My guess is 100 different types of squares. I’ve made over 75 quilts, but they weren’t all samplers. I would say as a minimum 1,000. I have only been quilting about 6 years. I’m guessing somewhere around 50. I am working on this years blockheads project and having so much fun. I am using scraps so not sure what I will end up with, lol. Love anything Moda and Kansas Troubles. Would love to win the book and fabric, thanks for the opportunity. Well I’m 60 and I started sewing and quilting when I was around 7 so I’m guessing around 500. Love sampler quilts. There must be hundreds after 25 years of quilting! I made the 48 Blockheads blocks but haven’t put them into a quilt yet. Wow, who’s counting? I have made at least over 50 different blocks and ready to try more! Thanks for the chance to win this great book and fabrics. I would guess somewhere around 50. I am participating in this years blockheads project and am really enjoying it. Love anything Moda and Kansas Troubles. Would love to win the book and fabric bundle. I am working with my scraps on the blockhead blocks and look forward to seeing all the scraps come together. Thanks for the opportunity! I would guess over a hundred but don’t know for positive. It looks likes wonderful book and gorgeous fabric, It would be lots of fun! Such a hard question to answer. I’ve been quilting for over 35 years so hundreds of different blocks for sure! Interesting question. I have been quilting about 20 years and if I assume I make at least 10 new blocks a year, my total would be 200. This seems reasonable, and perhaps too low, but I think I will go with 200. I think about 30. Not very many but looking forward to this book. I am new to quilting, maybe 36 blocks. I love sampler quilts-so pretty! I’ve probably made 25 blocks. Moda Blockheads rock! And the fabric is fabulous! I tend to use the same pieced block patterns over and over. It’s all about color and placement. So if we include the applique, maybe 30 blocks? Sounds like I need to expand my skills!! I haven’t had to many opportunities to make blocks because I just started quilting a year ago and I’m still learning. I hope to make all the blocks and put them in a quilt one day. I’m embarrassed to say I actually haven’t sewn any sampler blocks. But it is my big intention to start my first one in 2019. I have to find one that I can do first. So I guess I am not a blockhead but a want to be blockhead. Lol. I am hoping to also get some other girls from my quilting group involved at the same time. So we all end up with a lovely sampler. Lock quilt of all various personalities. I love seeing that eventuate. I can’t wait to start my first blocks. I have made too many different kinds of blocks to count, and I’m definitely a blockhead. About 5 years ago a group of close quilting friends named our small group that meets at least once a week the Blockheads. We even have our own closed member “The Blockheads” Facebook group. 800+ … i lost count over the years. I have made maybe twenty of the different blocks. Planning on doing a better job at managing my time better to try a few more new ones this next year, I have so many projects and so little time! I have made many different blocks in my quilting years. So guess I am at the top of the Blockhead list. I love the Moda blockheads. Traditional blocks are so fun to make. I’ve probably made 3,000 blocks since I started quilting. I’d love to win the book and the fabric to help my addiction. I have no idea. Maybe 10? I am having to think carefully to work out the number of blocks I have made from Splendid sampler. Not as many as I would like after a sewing hiatus because of illness. I think it is only fifteen. But I have been finishing UFO’s too! I’m still fairly new at this, but I’d guess I have probably made around 100 different blocks. Thanks for the opportunity to try to win this book and the fabric. I have made about 15 blocks, I’m a beginner and a I have a lot of thingsto learn and discover! Thank you for this opportunity! I’m on the newer side of quilting so it’s a lot less than many of the veteran quilters posting here! I’d guess 20 different blocks! too many to count and I just found some more. Now to put them together. If I win I could add them to the new Moda Blockheads I will make. With all the quilts I have made it has to be well over 100 blocks. Love the look of a sampler quilt with all those different blocks. Thanks for a chance to win. I have never counted the number of blocks but a lot. And I enjoy it every time. Translation: I’m a beginner … for now only 9 blocks, but in the book there are many inspirations … who knows …. 100s….including the blocks I re-designed to eliminate set-in seams. I have not been been quilting for all that long so I would say around 3500 blocks. Well now. Let’s see. 50 for BH1. 38 or something for BH 2. 51 so far for FGV. 48 for different BOM. 190? I’ve made hundreds of quilts and work on possibly 10-12 quilts a year. I can’t even guess how many blocks I’ve made… I started downloading these blocks and was doing quite well until about no 23… then I thought ah frig… I’ll buy the book. Thank you for the chance to win this package. I guesstimate I have made at least 1000 blocks since I began quilting! I LOVE Moda fabrics and blocks! I started quilting in 1992 and since then I have made quite a lot of quilts (in all sizes). I can’t say exactly how many blocks I made since starting but it must be over 500 for sure. I follow the Moda Blockheads and last year’s quilt is finished. Because of other projects I wanted to finish I did not make all the blocks this year, but I am planning to start next year again. I really love sampler quilt! 30 years as a quilter. I think I made several hundred of blocks. Many thanks for this giveaway. At first I thought I haven’t made that many different blocks because I’m a creature of habit. Then, I was reflecting on the mystery quilts I’ve started and other classes I’ve taken. I think maybe I’ve made around 30 different blocks. Still so many more to try. The book looks great! Thank you for the giveaway opportunity. I’ve probably only made 30 different blocks s but I want to make them ALL! This book would give me a good start. I couldn’t guess how many blocks I’ve made.I’ve quilted more as I have found unfinished quilt tops and either finished with sashing or just backing and binding. Wow, this is tough. I’ve been doing the monthly Saturday blocks at my quilt shop for about 14 years. I’ve found a few favorite blocks and tried new ones on my own, so I’d have to guess that I’ve made around 200 different blocks. I’m a pretty big block head!!! I am sure I have made 300 plus, very addicted!!! OMG! I’ve quilted over 28 years … 3500 or more! I’m just a medium sized blockhead wanting to do more so I can grow to be a much bigger blockhead in the future! The new book looks so appealing and inspiring! Thanks for the opportunity! I have been quilting for a loooong time. I’ve made thousands of blocks. I am really enjoying making the smaller blocks now, so Blockheads was right up my alley. Love the fabric line. My guess is that I have made 10 different blocks. I don’t have a lot of time to quilt, but when I retire, look out. I will be making new blocks left and right and all over the place! Thanks! Well my blockhead quilt ended up being 64 blocks…I have been quilting for 15 years. I would guess I have made 250 to 300 different blocks… this is a tough one to figure out. Thanks for the opportunity to win this great set. Not sure exactly, but at least 100. I learned to quilt about 30 years ago, but it’s only been in the past three years or so that I’ve had the time to really devote to it. One great thing about being an empty-nester! I’m guessing about 50 I’m not an expert quilter I just love it! 173, don’t know where that number came from! Lots and lots!! Some were only in my head that never made it in a quilt but it never gets old -starting a new quilt is always exciting. Love these quilters. Wow! I’m 60 and have been sewing since I was 10. My mom is a quilter and it’s in my blood. Now I’m teaching my granddaughter. I couldn’t even think how many I have made. THOUSANDS!! Alot. Been quilting since the 90’s. So an estimate? 5,000? Number of blocks made? Just guessing 20,000! LOTS! Thanks for the chance to win. Oh goodness, not anywhere near what I hope to achieve. Probably 500? Oh MY I’ve been a totally immersed quilter for 29 years. I never get tired of needle, thread, and fabric. Literally in the multiple thousands. I am a beginner so maybe 6? I have sewn 3743 blocks. What fun! I’ve been quilting since the early 1980’s! I’ve made thousands of quilt blocks and have thousands more to make! I loved the blockheads quilt along! And would love to win this book along with Lynn’s gorgeous fabrics! PICK ME! Quilting since the early ’90s – I have no idea how many blocks I’ve made. I plan to keep making them as long as I can. I loved the Blockheads blocks (and the Blockheads 2). This book and fabric would be a welcome addition to my stash! Thanks for the opportunity! No idea at all – sometimes I find a favorite and make that same pattern in different colorways – and I’ve made a couple sampler quilts – so 12 to 12,000 – somewhere in between. I’ve been quilting over 30 years, so my guess is 1,000. I have thoroughly enjoyed the Blockheads group & the designers for both Blockheads 1 & 2. They have great instruction and even though we are all making the same blocks the quilts are all unique. thank you all for the experience! I have no idea how many blocks, but hope for many more. At least 200 but my favorites are stars. Love stars! Not much of a blockhead here but with a new book that could change. Lets see now, nearly 50 years of quilting, many quilts a year, lots of scrap ones, perhaps 150 different blocks. But when you are involved with playing around in a hobby you love, who ls counting? Thank you for creating this lovely game. Wow this one is really hard to try to figure out, so I am guessing 300 different ones that I have actually made! I have tons of books and patterns that I want to make,and are great for inspiration! Probably around 500 blocks. Love the idea of this book. I would estimate that I have made 40-50 different blocks. Thanks for the great giveaway! Thousands, love piecing….I call myself a piece not a quilter. I have only been quilting for a few years, so I would guess I have made around 30 different types of blocks and probably hundreds I would love to make. I didnt get to do the Blockheads 2017 (I didnt know about it ) but im in on the 2018 one and have had so much fun learning from it (im still a newbie) cant wait to see if there will be 2019 !! I’m a new quilter so I would say I’ve made maybe a hundred blocks since I started a few years ago. I’m really excited about this book because my mom and I are each going to make a Blockhead quilt together! Beautiful quilts! I’m guessing 65 different blocks so far. Oh my… I’m guessing about 100 over 13 years of quilting. I love the book and making sampler quilts. i’ve belonged to several BOM clubs, so I’m guessing over 200 different blocks. Love the blockheads and above all the lovely Moda Fabric. I believe I have made 50 or so. 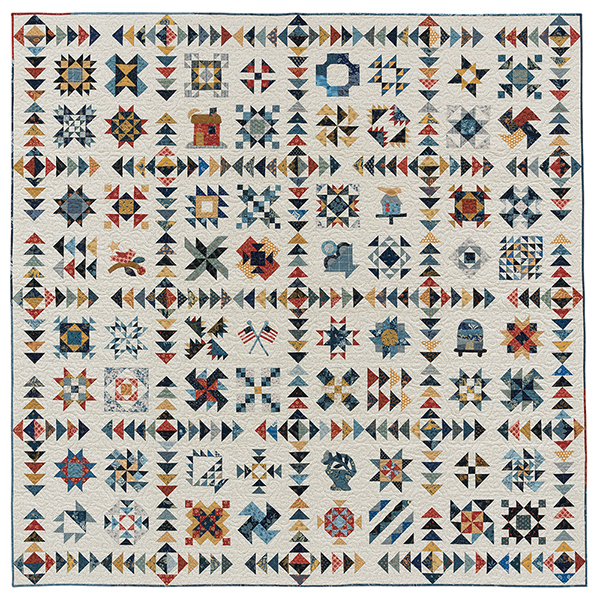 The sampler quilt looks like something I would like to enjoy doing. Not very many compared to most! I love to do projects that are a whole piece. I’d say maybe 50!! But I’d love this to have a good start on some new patterns! What an awesome give away! Hope I win! I would like to pick some of my favorite blocks and build a quilt on that! I have probably made a hundred. This book looks incredible! Thanks for doing the giveaway! I have made approximately 250 different blocks so far a few I have designed myself. Thousands of blocks from a lifetime of sewing. Oh my, who can count that high. I just wish more were for myself! Purely a guesstimate, but I’m a six digit blockhead. And still going strong! Would love to have this book and the lovely fabric. I’m participating in Moda Blockheads 2. I joined after being inspired by a friend who did a beautiful job on Round 1. Thanks for the opportunity. Too many to count. Several quilts I have made had over 800 blocks in one quilt. I love all the quilts made by your designer group. Isn’t it fun to see how different they each look? I haven’t made many, tend to use the same ones, which is why I need this book in my life! I have no idea. Maybe 60? It’s hard even to guestimate, but my guess is around 60. I don’t even know how to estimate the number of blocks I’ve sewn since I started quilting. I do know that I absolutely love to spend every minute I can feeding my soul! My guess is 25,000 blocks. Thank you for this great giveaway! I will guess 75, but it could be more. I would love the Blockheads book and fabric to make many more. My guild has sponsored BOM quilts and row quilts in the past. It’s always wonderful to see the results. Guild members have used the same blocks with such different results. The 2019 BOM blocks will come from two members each month. A different process. Looking forward to the results. Appreciate the new name ‘I’m a BLOCKHEAD’! We will hang them in our quilt show in September. I would love th win your book package. If I don’t, I’ll buy the book some time down the line 🤗!! Around 75 would be my best guess. Maybe like 50 different blocks. I would definitely like to expand my repertoire! Probably more than I remember but maybe 25. Love Lisa quilt. Oh lets be truthful I would live ti make them all! Happy Holidays to all the artists and thanks for sharing your talent. This would be such a fun, and challenging year project. I can imagine so many possibilities. Please pick me…and I will be forever grateful. I was sorry I didn’t download these blocks as they were offered and created. The finished quilts are spectacular! I have no idea how many blocks I’ve made in the 35+ years I’ve been quilting but I’m always finding new things to do. Thanks for the chance to win this book! Just getting started, so probably only 40 or 45. Here’s hoping I win the book and FQs so I can learn more! Oh my gosh is “lots” an appropriate answer? I have made easy ones, tedious ones, perfect ones, crooked uncooperative ones, churn dash, pinapple, turkey track, flying geese, basket, stars of many kinds, staight, curved, 4 and 9 patch, big, medium, small and tiny and soooo many more to go! I don’t have a clue how many different blocks I have made, but I love sampler quilts, and am currently working on Blockheads 2. This book and fabric bundle would be great for exploring even more blocks! Sew excited to be able to enter this giveaway. I’ve been hinting for this book for Christmas! And a bonus would be the fabric tower! Hope I win! I’ve been a block-head my entire life, but it’s only when I discovered quilting that I understood why and became okay with it! Fairly new to the quilting scene I’ve made several quilts from baby clothes and scraps and have, in the process, developed an unhealthy obsession toward sampler quilts… “unhealthy” being a term my family uses. If I were lucky enough to get this book and stash of fabric it would be a dream come true! Gosh, at least a hundred, but trying new things all the time. What a great book! I would do anything with a pinwheel first and it looks like you have quite a few of those in there, with a lot of good looking blocks I would LOVE to try. What a great opportunity for a beginner! I have just begun on my quilting journey – so I would say I have done 6 different blocks of those shown. I did create my own design to make mug rugs for friends as a way to practice HST and flying geese. I have likely made over 100 different blocks. Maybe 200. I would love to win this! I made one when my oldest son was born. Time to start at it again. I have made maybe 36 plus blocks in the 50 years I am quilting. for the opportunity to get the gift! Not a lot but working on it. Oodles and Oodles 🙃 so many blocks to do and so little time! I’m kind of new so probably only 20. I have a long way to go. I have made 6 or 7 blocks from this book and look forward to remaking all plus more for a beautiful quilt like Carries. I started quilting at 50 yrs old, so I would guess about 1000 blocks~ I love being in sew alongs!! How many blocks over 40 years? Hmmmmmm 4000? Could be. quilting is my passion. Total guesstimate of a thousand. I’m guessing I’ve made 60-70 different blocks. Certainly I’ve made to many to count, but my favorite block is a great basket pattern. I know off the top of my head, 12 for sure. I am a true Blockhead! I made all these blocks and I made two or three quilts when Moda was giving these patterns away for free. I love to sew pieced blocks and applique blocks and all kinds of sashings to put the quilt together. I have been sewing since I was a girl and quilting for over 25 years. I love blocks with HST’s and stars. Thanks for the chance to win! I’ve made numerous BOM quilts along with other patterns, so I’m guessing somewhere over 500 different block patterns. What a fun project! I can only guess the number of blocks I’ve made — and this is conservative. I’m guessing at least theee to four hundred blocks. I’ve been quilting for a very long time so it is hard to guess. Another thing I should have kept track of? No, I would rather be quilting than tracking the number of blocks I’ve made. Thank you, ladies! Your designs are marvelous! Love this! Would love to make these blocks! I’m guessing I’ve made 100+ Different blocks over all the years I’ve been quilting!! Very hard to figure that out!! But I sew everyday! I would guess somewhere over 200. Between the 8 sampler quilts and being in charge of our guilds BOM committee for several years. Forgot to answer the question! Oppps! After almost 40 years of quilting to many to evan begin to count. Thousands. Probably only a dozen or so. A good instruction book might give me the cofidence to try more! At least one or 2 in every quilt I have made& in most tabletoppers I made/After I learn a technique I make it my own. to many to begin counting. I am a newer quilter so I probably have made maybe 600 blocks total since I began quilting. I am a want to be blockhead. Thousands more than I want to contemplate. I have been quilting for over 50 years and have never met a block I really disliked. I love primitive style! I haven’t made many quilts yet because I started stitching a few years ago, but I have bought some of your books on line. In Argentina patchwork is not so common but those who get in touch with it cannot stop sewing! ‘m not sure how many I’ve made. There are so many. I do know I’ve stayed away from some of the more challenging ones. Maybe this book would give me the courage to expand my skills and block knowledge. Oh my, have sewn a lot of blocks in my life, and to give a quesstament I believe around 500 and counting…Yikes! I have no idea! Maybe 100 or so? I am not sure. 200? Sorry if duplicated. No indication that it went. Just sat there and then ….. I am not sure, but I have to thing about 200. I surely have not kept count, so glad we can guess! Repeats of blocks within quilts and "units" not withstanding, I would "guess" around 50 or so actual different blocks. I certainly hope to increase this number and have yet to make a sampler which would give me a big jump right away! Definitely on the list, I love samplers. So many quilts so little time, we all have that in common! Thanks so much to all the "Blockhead" Designers, this book has tons of inspiration and creativity. I have been quilting for 20 years. I would estimate I have made over 150 types of blocks. The thing I find interesting g is that we never run into a dead end with having something new to see or create. That is why Quilters are living and appreciating the Mida Blockhead Series. About 400. We have had block of the month every year for about 30 years, so that is 300. Easily another 100 from groups, my own quilts and samplers. Probably over a hundred, but learining! Guesstimate is 65. I am slow. Learned to quilt in the early 90s making a sampler quilt. Did not continue quilting til I retired in 2010. love color, fabric, studying patterns in books and magazines. Enjoy Blockheads. I am new to quilting, so just 2 or 3. 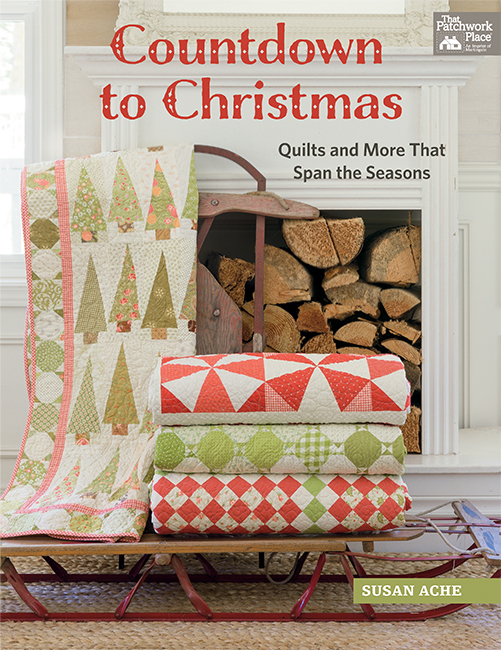 Thanks for the chance to win a super quilting book and some awesome fabric! I have so enjoyed the blockheads patterns and the posts from those with time to get more done than I have. I would do many of them scrappy. I still feel like a "newby" to quilting but think I have done so many more than I realize in the last few years. Too many on the "to do" list by the time I get one done.n Still love new books to browse. I’ve actually only made four, but that’s because I’m a brand new quilter. The good news is, I have no plans on stopping! The joy of making and finishing a quilt is only topped by seeing the recipient’s expression when they receive it. I honestly don’t know. I really appreciated Block Heads for the opportunities to try new blocks and see how others did them – it was a great learning experience. Possibly about 30 different blocks over the years! I love the fabrics and the book would add to my number of blocks! I would be thankful to win! I’ve only been quilting for a short time. I’ll guestimate about 3 dozen different quilt blocks. Not sure but well over 300!! I have been at this for 23+ years!! I was bitten by the quilting bug 5 yrs ago. Since then, my daughter and granddaughter have moved in with me and have also begun quilting. It’s a wonderful bond. Guess we’re a Block Head family ! How many blocks have I made ? LOTS. Probably about 200 different blocks!! I’ve been Quilting for 23+ years!! I have never thought of counting but I would think it would be more than 75! I have at least 15 block quilts with at least 12 blocks in each one so that would make at last 180 blocks I’ve pieced. I do a lot of trading blocks, too. It would be impossible to calculate how many blocks I’ve pieced in my 30 plus years of quilting. I have probably made 300 blocks. I have started a Dear Jane and I hope I will finish it before it finishes me, lol. I’ve been quilting for about 5 years. Hello, my name is Julia and I am a Blockhead! I have probably made over 400 blocks. Majority are different star blocks. Our guild does a friendship block 4 times a year so I’ve probably made at least 80 different ones just for that exchange. Love trying new blocks. Can’t wait to get this book. It’s on my Santa list! Probably fewer than 50 different blocks. The only sampler quilt I have was the result of a group block exchange, so I made one design, got many in return. More than I have fingers and toes. I can’t begin to guesstimate the number of quilt blocks I have made in my 20 years of quilting but I would think in excess of 10,000. I have come to quilting later in life but I am so addicted. About 230 blocks including some that have been designed by myself or my husband. Thanks. I bet I have made 400 blocks in my lifetime. I like piecing, appliqué and I am fairly new to wool appliqué. I love Lisa Bonjeans designs! I have made only 6 different blocks as I am a new quilter. I have made hundreds. My favorite were the "Morning Star" block I worked on with my sister after our father died. We asked our mother for some of Daddy’s shirts (including his John Deere work shirts). We used each shirt to make one block. We used his used jeans for pieces that needed extra weight. We backed it in a soft neutral flannel and gave it to our mother. It has become a great keepsake and remembrance of him. I would sure love to win that book and fabric!! I’m a newer quilter so I’d day I’ve probably made around 100 or less. And that beautiful fabric. I want to branch out with my skills. I have probably made over 100 different blocks. I would love to win! I have probably made at least100 or more. Many, many and always learning something new. I’ve made over 50 different blocks – it’s fun to make something different! Let’s see, I have only been quilting for two years and have made several quilts. I am in the midst of Moda Blockheads 2 right now so my guesstimate for blocks made is close to 100. I am not sure how many blocks I did, because I usually design my own quilts. It may be around ten vor so. But I would be eager to learn more from the book! Patchwork and quilting are still not so populär in East Germany where I live. Guessing here but maybe 50. I try to learn/make a new block in at least 2 quilts a month. Thanks for the awesome giveaway. Am so looking forward to this book. Just LOVE Blockheads and the fabric is to die for! Merry Christmas!! How many blocks? OOOOOO! That’s a tough one! I’ve worked on the Farmer’s Wife, I’ve made samplers, I’ve done blocks of the month. . .probably in the 500s at least. . .And I absolutely love the designers featured in this book-particularly Jan Patek-and her quilt in the above ad!! I think I have made around 40 different blocks, several repeated many times. I admire the quilters whose work are included in this book. It would be an honor to own and use the book. I love "sampler" books. So much fun making many different blocks. Since I started quilting late in life I’d guesstimate I’ve made 19800! Can’t wait to read all the other guesses. It must be in the millions for most of you. Having trouble wrapping my “blockhead” around an answer to that question since sampler quilts are my favorite and I have made so many over the years of quilting! Lovely gift to win! So far, I’ve made 3 different block styles. I am a relatively new quilter. I am working on learning to make many more blocks. I love the Sampler type quilts and I’ve made several, so I’d have to guess over 200 different blocks. WOW. After about 250 quilts I have lost count. Love trying new ones. Looks like the book would be a joy to use. The fabric is beautiful too. At the least, over 300. I love the Blockhead postings and have been making them for the past 2 years. But I will say I missed a few of the Blockheads first time around so I’d love to win this book! The fabric bundle by Lynn would be a fab bonus as well. Thanks for the chance! I have done a few blocks of the month quilts and I’m still a beginner so probably around 40 different blocks. I have enjoyed it every step and am happy to be improving in my piecing. Almost certainly over 100. I like making different designs – even if they are variations – like different stars. And in 30 years or so that adds up. I am a new quilter. Just squares and rectangles and straight sewing. My stash does not count as a stash. I have made coasters and table runners with crochet borders, so I estimate under 50. Maybe this book will give me the push to venture further in my quilting "career". Thanks for the giveaway. I have no idea, but to start I made Farmer’s Wife so that’s at least over a hundred. Who would of thought to count. I am a big blockhead! I have made hundreds over the years and would love this book so I can make more! Probably at least 1,000 blocks – I sew night and day since I’ve happily retired! Last year i did a block-a-day and a block-a-week and a block-a-month. So total, with others thrown in, close to 500. I bet hundreds. I have been quilting for a while although I am not a fast quilter. I love the process. I would love to win the above. I am a Blockhead, I know. In 26+ years of quilting, I’ve probably made a ga-zillion quilt blocks. But who is counting, right? It would be fun to win the Blockheads pattern book! In my quilting life, I’ve probably made three or four quilting blocks. Still a (very) beginner! Thanks yet again for such a generous giveaway. that’s a hard question. it would be in the 100’s. maybe 1000’s!!! i love the moda blockheads and have been following and downloading both the 1st and second sets. it would be awesome to have this book! i haven’t started any blockhead blocks yet but they are on my list to do soon…after i finish my grandson’s car quilt and make a quilt for a new great niece. What a good question! I have made over a hundred different blocks over the years. Thanks for the chance to win this great book and fabric! That’s a very hard question. My first quilts were samplers for the learning process and so there have been many different blocks. So probably over 200. Is a zillion a good answer? Maybe not quite that many but I do love making older traditional blocks and thinking about the people who used to make them by hand and lamp/candle light. THEY were the true artisans! How many quilt block? That’s an interesting question. I can’t begin to count how many different quilt blocks I have sewn over the forty plus years that I have been quilting. This book would be good inspiration to use even more quilt block designs in my projects. Whoa! I am 76 and have been quilting most of my life. I started sewing at 16 using my mothers treadle machine. I am not sure of how many blocks I have completed in those 60 years of quilting but it is a bundle for sure. Love the book and the fabrics look wonderful. I have no idea how many blocks I’ve made but I would guess around 50. These days I’m dedigning my own quilts and often don’t make a block, but I still love block designs! Thanks for the giveaway! I have done lots of blocks–for a guess, maybe 50. Would love that book and beautiful fabric!! Goodness, what a question! Well, let’s see, there are 52 quilts in my scrapbook, and several of them are samplers. That doesn’t count all the pillows, tote bags, ornaments, etc made as gifts over the years… or the WIPs in the cupboard. Guessing at least 1000. Thanks for a chance to win. I have probably made 20 different blocks. I hope to add to that number in the next few years. My best guess is about 150 blocks. I really haven’t made many quilts but that 150 is spread out over many years of stitching. Oh my, I have no idea. I would guess 20. I have not been quilting very long. I love sampler quilts and row quilts! Over the years, I’d estimate I’ve sewn over 200 different blocks. Since I like to try new things a minimum of 60 works for me. You know how it is Kids, family, work, commitments have a way of interfering with sewing time!! Gosh, I’ve never thought about it. Maybe 20? Sometimes, I make just one block for a pillow, so it might add up to about that. Great giveaway! Thanks. I would think close to 100. I’ve been doing this for awhile. I have participated in many block of the month drawings over the years, so I guess about 100. I like doing just a block or two also, and making a sampler. I get bored making too many of the same block over and over. Countless blocks! I have no idea. Wow, what a great question!! I do have my favourites I’ve made over and over again but I have made a pretty big variety – several hundred I guess! Thank you for the giveaw ay! I’m just a little bit of a Block Head. I’ve probably done about 100-200 blocks but I love how this book shows them put together. Great ideas!!! and I am waiting for all of them before I begin to sew them. Thank you Moda. I Also have loved your fabrics for years. I would have to guess at 400-500 or even more! Love this prize. I try to make a different block each time, even if it is repeated in the quilt, so that would mean about a hundred or more….. I have probably made hundreds of different blocks. Hard to really know since I have been quilting for about 10 years. Some blocks are my favorite and I make them over and over again. When I sat down and counted the quilts I have made to completion in the last 30years it came to 98! I did not realize how many I had done! This does not include UFOs that I have packed away. I would love to have the book for the blockheads patterns! Thank you for the opportunity to win! What a question…the many squares I have made over the years are the foundations for the many quilts made for others…family, friends, and fund raisers. I really haven’t kept track of the separate squares. I guess you would call me a real BLOCKHEAD. Let’s guess 200-300. At 78 I have forgotten some of my work so that is just my best guess. I’d love to get the book and fabric so I can continue my crazy old lady quilting life. Thanks for thinking of me. I am still a beginner so I still dont have made many blocks, maybe 4 or 5. But I am sure that will become much more in the next year. I have to guess. 300- 400 – 500 different blocks or even more. I really don’t know. I like to try new blocks and techniques. I have made so many sampler quilts through my local quilt shop over the years, with every block being different, plus with some designers through the mail. Wow, it must be over 400! Thanks! It’s a good thing you’re allowing guestimates, because…who keeps track of these things??? I’d guess I’ve made about 75 different blocks. I tend to make many more of the ones I love, or I’m sure that number would be higher. Having participated in the splendid sampler and several other qal I probably made a couple hundred different blocks. Over a 1000, I don’t count. Have fun taking the same block and do different colors and different setting. Quilting is never ending after 30 plus years of daily fun of quilting. It has really become my life from the start at 6 years old. I would rather sew than read and do school work. I follow Moda Blocks . They are so nice and I like to make them. I make at least 25 per year by participating in 2 guild bom programs and I have run another club that uses a bom. So much fun to make one block and then see if you want to make more! Wow, what a question! How long is a piece of string, I guess it will be hundreds, I’ve been quilting for about 10 years, so that’s a lot of different blocks. Sampler quilts are my favourite, I like the variety and it stops me getting bored. I’m a newbie maybe 10. Whew!! That’s a tough question, I would say 200+ quilt blocks..that’s just a wild guess!! I’ve made many many blocks and I’ll guess maybe 500 different ones. When I finish both Blockheads, there will be many more. I have only been quilting for a few years and am addicted. I have made so many quilts which I personally quilt that it is impossible to count. With Dear Jane, sew samplers by Pat & Jane, Jacquelynne Steve’s sew alongs, Moda blocks, aurifil etc. I could go on and on so there have been thousands even though many of them are repeats, duplicates or variations. You can never have enough fabric or quilts so I would really love to win this fantastic book and fabric pack. Never have won anything in my life though so I’d say my luck is about 2 million to one. But thanks for the opportunity. Merry Christmas to all.. I guess I’m not very adventurous on my own, but my TreadleOn exchanges have forced me to try new and interesting blocks and techniques. My guilds have also assisted me in my move to the "wild" side. I’ve not counted but I’m thinking that 90 different blocks would be a conservative guess. I have probably make around 30 different ones, but many repeated. I love the fabrics used by the different designers, making the same block look very different. Gosh, I guess I have made some where around 75 or 80. I have been quilting for about 18 years and retired for almost 5 years. I love this fabric. It speaks my colors. Would love to make a quilt from this bundle! Love all the blocks! The quilts are so gorgeous! I’ve been quilting for almost 30 years and I’m not sure if how many different blocks or the total number of blocks made but I’m definitely a Block Head! and proud of it, hehe. I have no real idea. But I would guess at least 25. I’m guessing I’ve made maybe 40 different kinds of blocks. I’ve never made a sampler quilt before, but I’d love to try one of these! Hundreds! I designed block of the month quilts for a quilt store several years ago, so many were included in each quilt. I liked to put a little spin on traditional blocks. I would guess over 100. Guesstimate that I’ve made maybe 40-50 different block patterns. Of them are appliqued. The blocks in the book are lovely. At least 150 blocks, including the 3 dozen “cross” patterns for a retiring minister who had a large collection of crosses. I still turn to my copy of Mary Ellen Hopkin’s “It’s Okay…” book to choose more variety. Cheers! I can’t begin to imagine how many different blocks I have made, but I am sure well over 200-300 since I do a lot of paperpiecing, too. Probably 200 to 250, probably more. I’ve been quilting for about forty years, and have made quilts for seven children, 17 grandchildren (some more than one) and 5 great grandchildren plus raffle quilts, Quilts of Valor etc. I guess I am a blockhead. It’s hard to guess– maybe 25. I can’t imagine how many blocks I have made in my quilting life of about 30 years! I’ll just say 2500, give or take! In 2019, I am cutting back to part time at my workplace, so hopefully I will have more time to add to that total. I’m guessing about 50 different blocks. Such a hard question and I’ve only been quilting for about 5 years! My guesstimate would have to be around 100. I’d love to win this prize so I could increase that estimate making some of these lovely blocks!! Wow, it would have to be close to 200 or more since the last quilt I made had 50 different blocks in just that one quilt! thanks for the opportunity to win the fabric and book…what a great gift for somebunny! Hundreds of different blocks. Have been collecting the various Blockhead blocks..Great resource and I love all the different settings! between 50 and a 100. some traditional, some made up. between 50 and a 100; some made up, some traditional. My guesstimate is 75-plus blocks. Started with a sampler quilt and have enjoyed my quilting journey. Oh my word–what a question! I’ve never considered it, but it must be in the hundreds. Unless we are talking unique patterns, then it would probably be more like fifty distinct blocks, repeated over and over again, in variations. Different? 50 in 25 years? Oh wow, such a hard one to answer. Haven’t kept track of how many different blocks I’ve made over the years. Must be between 2 & 300 at least. 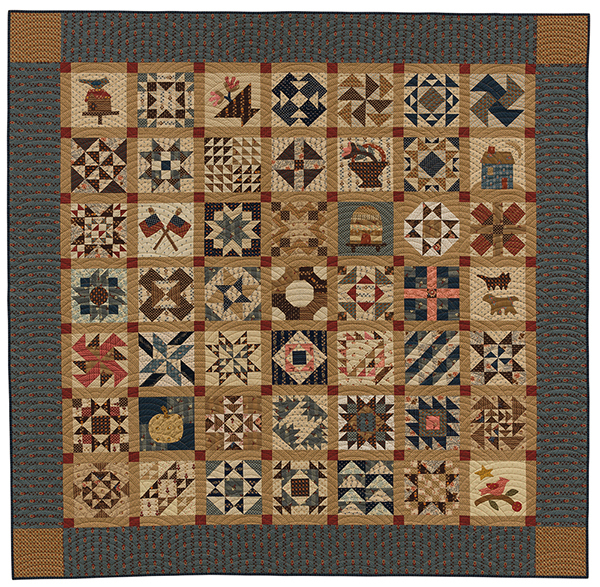 My last sampler had more than 30 nine inch blocks (done in civil war era reproduced prints). Winning this fabulous bundle and book would be the best Christmas present ever. There are a couple of the features quilts the ladies made that are on my "wish list" to try putting together. Hard question to answer since I’ve been quilting/sewing for a very long time. A rough guess would be in the hundreds. Would love to win the book and be able to try more. I’m 77, and I started quilting 40 years ago. My quilts were done entirely by hand, from cutting blocks to binding to quilting. No counting the blocks I tackled, with no idea of how I should be doing it. After taking 20 years off for a “job,” I’m back to quilting and learning every day, with much amazement of how the quilting process has evolved. I’d love to have this book. Not sure but since I’ve worked on one of those farmers daughter patterns, probably 75 or so! Thanks! Just a novice quilter. Lots of blocks, but low on the variety. These designs are awesome! The number I guesstimate would be 102. 32,425…. Roughly… Lol… And loved every single one…. I am a fairly new quilter, just 2 years! I would guess I have made around 150 different blocks, with the majority being Blockheads blocks! The number of blocks was less than I thought for all the hundreds of quilts I’ve made, about 30. I’ve made few samplers and use my old-stand-bys time and time again. I was introduced to quilting five years ago. Started sewing for a children’s charity through a church, so my guesstimate is 30 different blocks. Thank you for the opportunity. 47different blocks, over 200 quilts and still going. I have not made that many as I am fairly new to quilting but I am hooked. I’ve probably made approximately 50 blocks in my quilting career so far but expect too make many, many more! Not sure since I love blocks and tweak them for small changes. I love the book & fabrics. Fun! Fun! Fun! I know it’s over 600, and there’s more in my present and future!!! Yes! Need. Fabric. Love quilting!!! I have been quilting about eleven years and love the challenge of new blocks. Every block can look so different because of the fabric selected. I have proba made several hundred different blocks, and I might need to keep track going forward. The book looks very interesting and I hope I will win it and have the opportunity to make the blocks with this gorgeous new fabric. 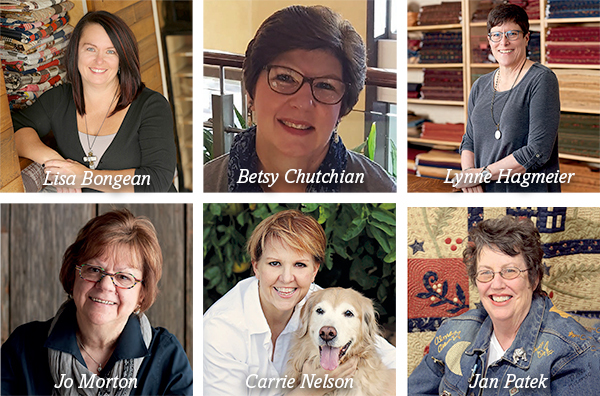 I am excited to see all these talented quilters work together on this book. Oh at least 40. I’ve made samplers and am always interested in learning something new. Wow ! I have been quilting 20 years but tend to make the same blocks often. I tend to like STARS=So how many stars are there? I have never thought about this question before. I make what appeals to me. Sometimes making the same block gives a grat secondary pattern. Guesstimate, over 300 that would include many flavors of my work. Still have a greater amount to do. I’ve probably made about 50. Just getting started! Several hundred for sure – for quilts, table runners, pillows, etc. I would guess that I have probably made over 300 different blocks over the years. It’s an interesting question really. We keep track of how many quilts we make;I may have to go back really count the number of different blocks lol! Probably made about 20 blocks. I took up quilting after retiring and look forward to spending more time at it. Thanks. I am going to guess that I have made at least 250 blocks. That is just a guess. I have been quilting for 38 years; maybe 200+ different blocks. I love doing different blocks and am guessing 100 plus from many many books over the years. It would have been fun to keep track. I’m brand new to quilting so I have some blocks I need to get started on. I would guestimate somewhere in the neighborhood of 40 to 50 different blocks. I haven’t been making quilts all that long so I know there is plenty more for me to learn. At least 50, probably more since I have done many BOM for quilt guild. I have no idea. I like to try new blocks all the time, so the number would have to be high! What a question! Maybe close to one hundred. At a very rough guess, maybe 30. Since I love to keep trying new ways to make a block and often combine many different ones in a quilt, I would have to guess about 80 to 100 at this point. I keep looking for more. I am a newby – so I would say less than 25 so far. If I had made just one block a week over the last 30 odd years that would be around 1600 blocks. I must have made more than that over the years. I’ve helped on quilts with my grandmother since I was a little girl. On my own I’ve done a handful! I probably have made 20 different blocks in the past. That for sure is a guesstimate! These blocks are the best yet. I will be making these 48 if time allows. My mother would give me her scraps and I would make grandmother’s flower garden right along side of her when I was about age 6. I am so fortunate that she got me interested in quilting and I have never lost interest. Thank you for these wonderful blocks! I’ve been sort of conservative with learning new blocks, as when I see them all I just want to make them all. I’ve been working on king sized quilts and then hand quilting them, so a quilt takes about a year. This sort of quilt – Blockhead" would be good for my ADD. Lots going on and very entertaining. I’m a relative newbie and tend to stick with ‘standard’ blocks as I learn, so only a handful- four patch, nine patch, half-square triangles, and strip-pieced quarter square triangles. Conservatly I would think 500 different blocks but would love the book to learn more as I am self taught and ohhhh the fabric! None yet, I am just learning how to quilt. I am brand new to quilting so I have yet to make a quilt block. I have made about 20 so far.